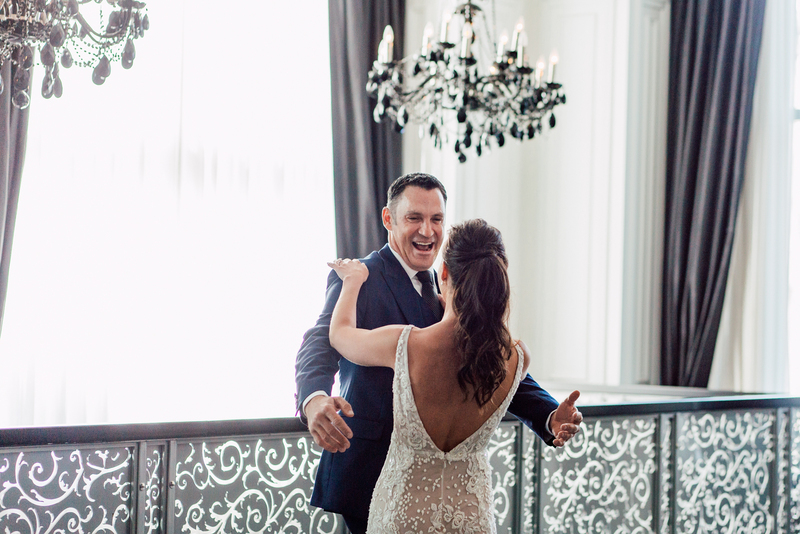 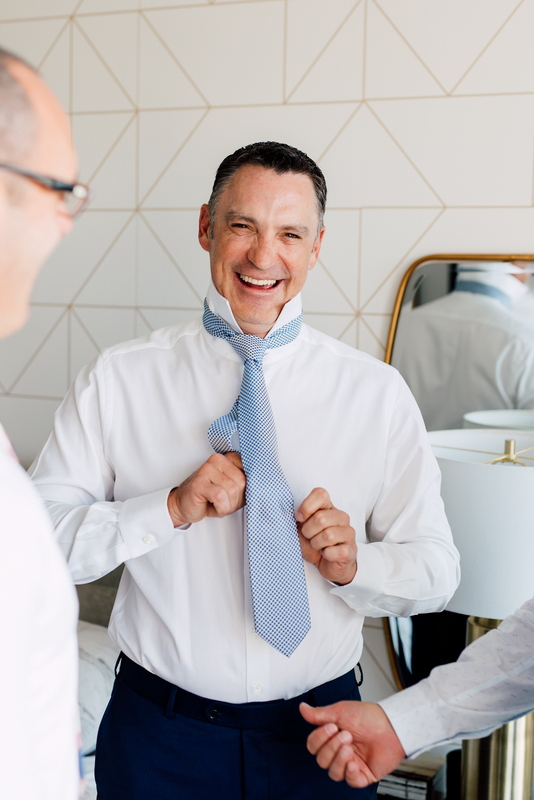 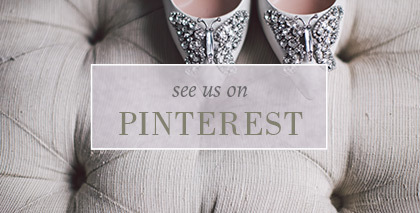 You can never go wrong with dancing happy brides and dapper grooms! 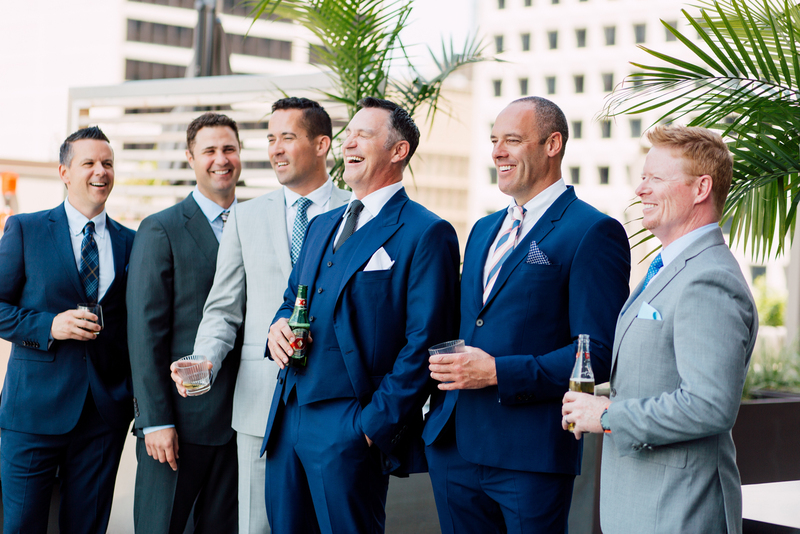 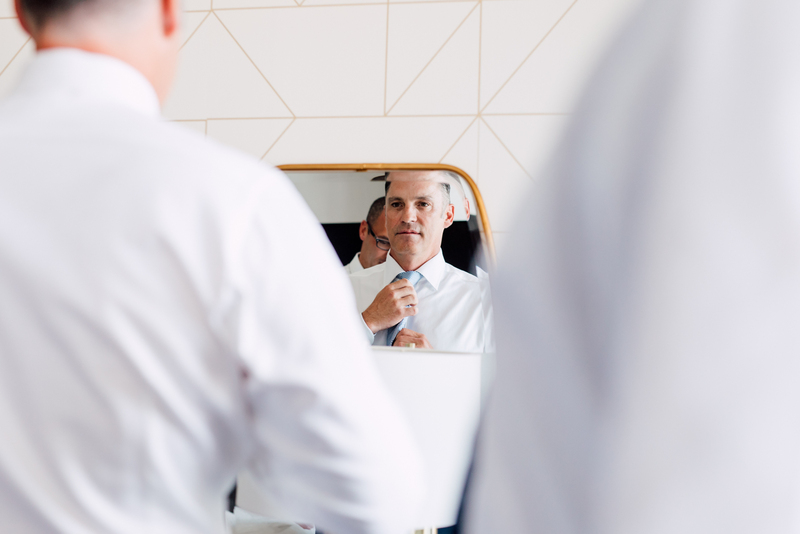 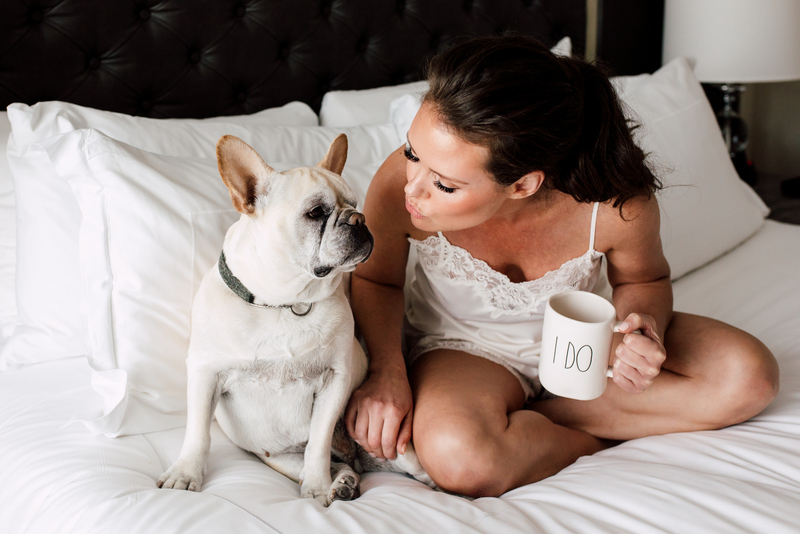 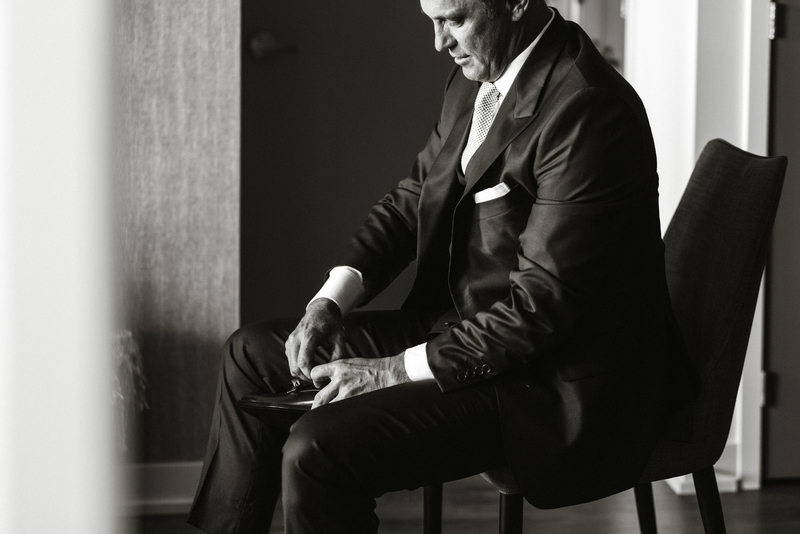 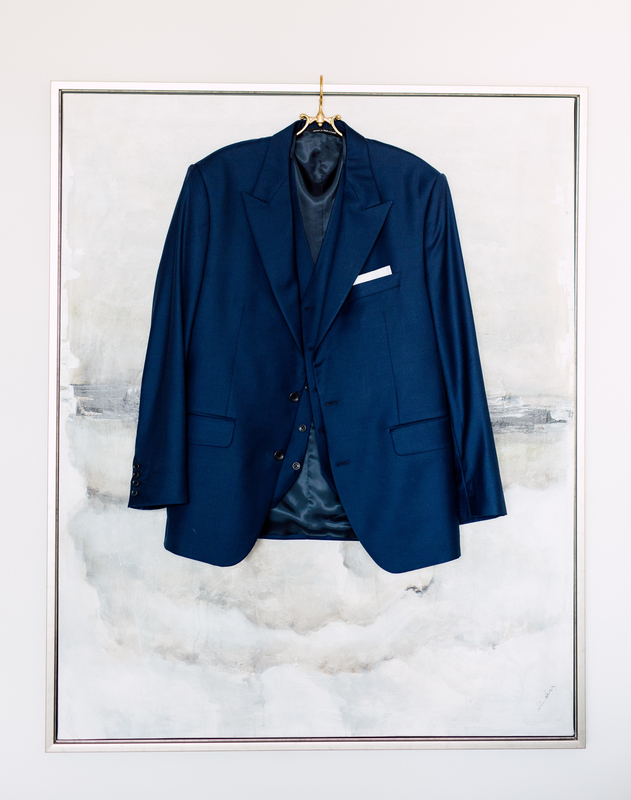 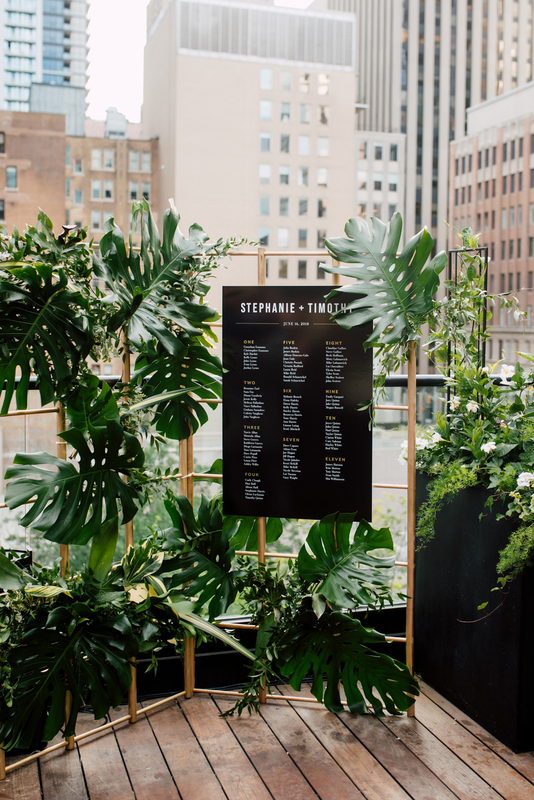 Stephanie and Timothy’s wedding day is the definition of cool. 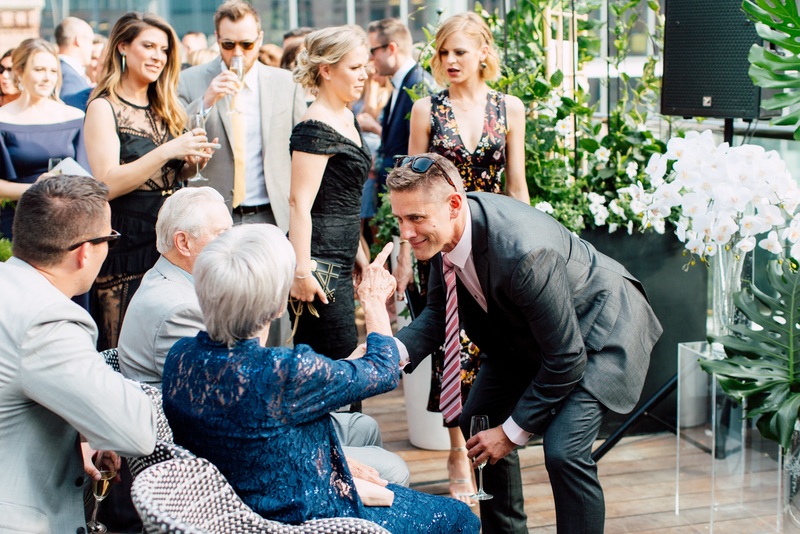 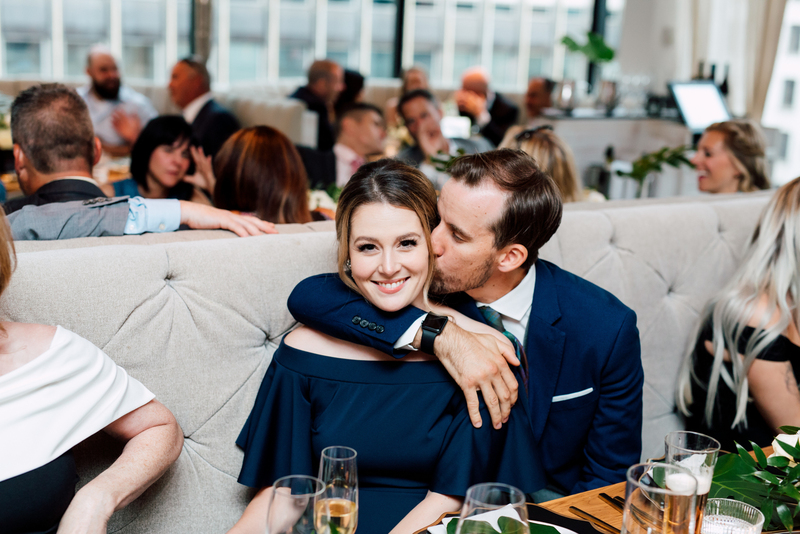 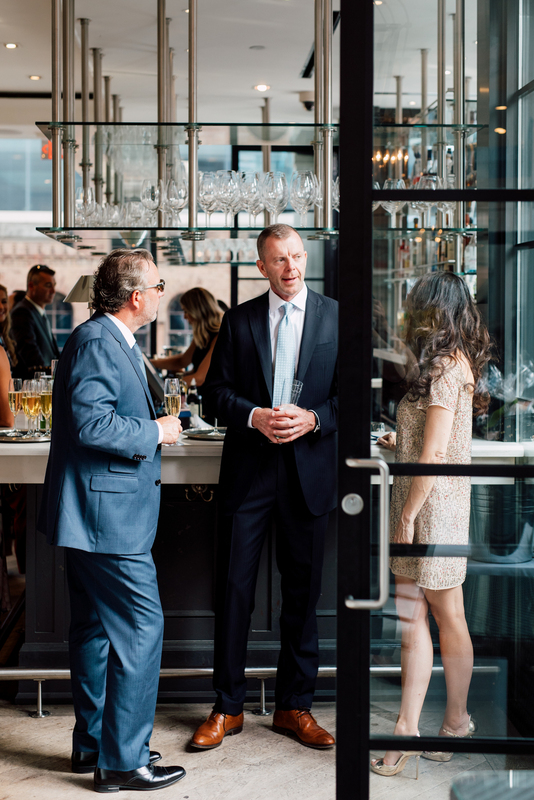 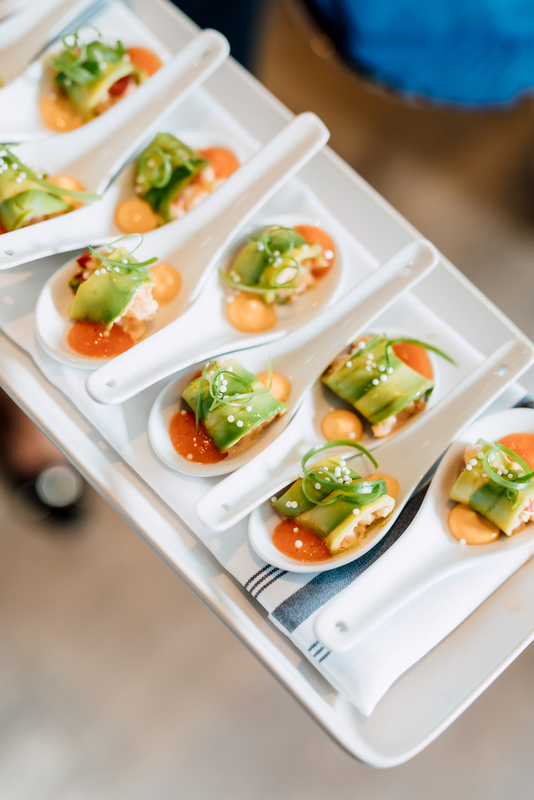 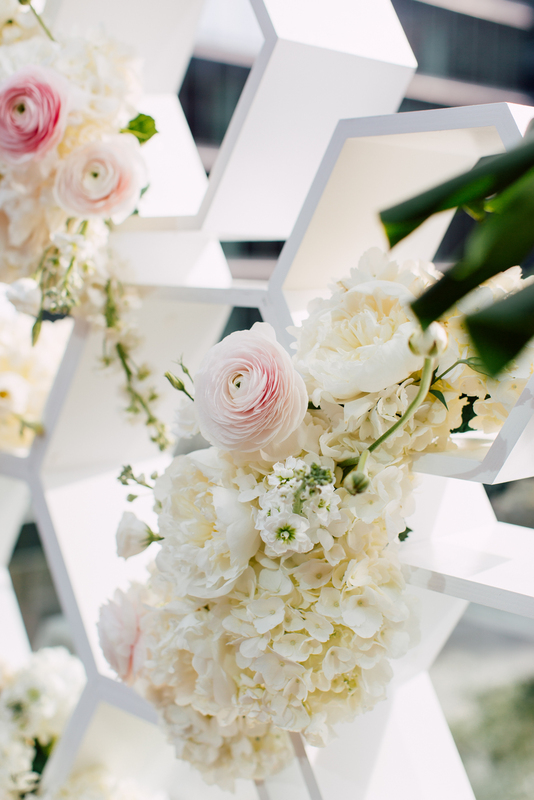 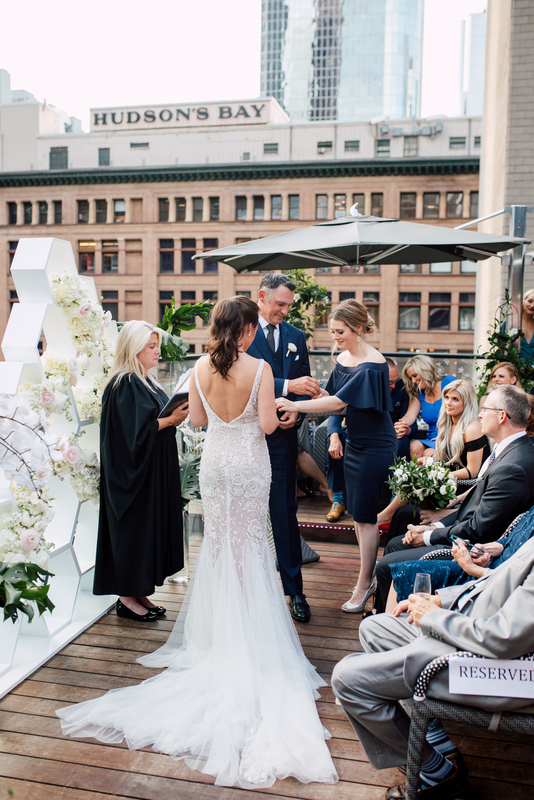 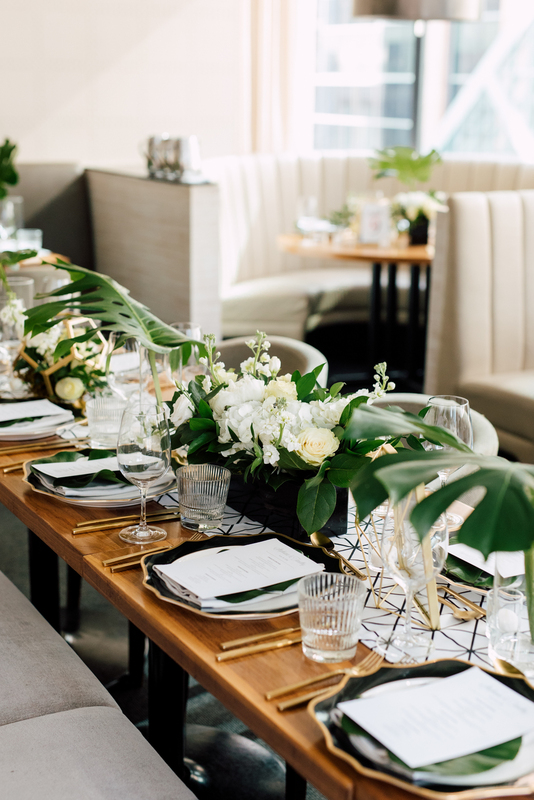 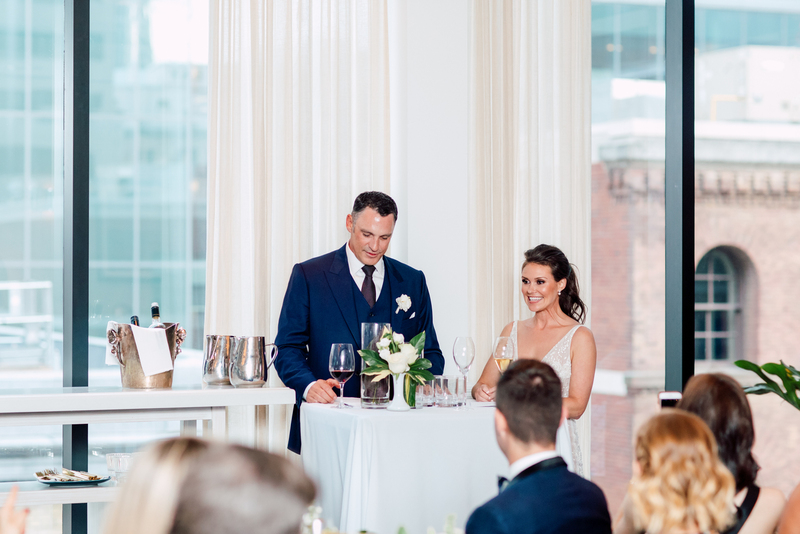 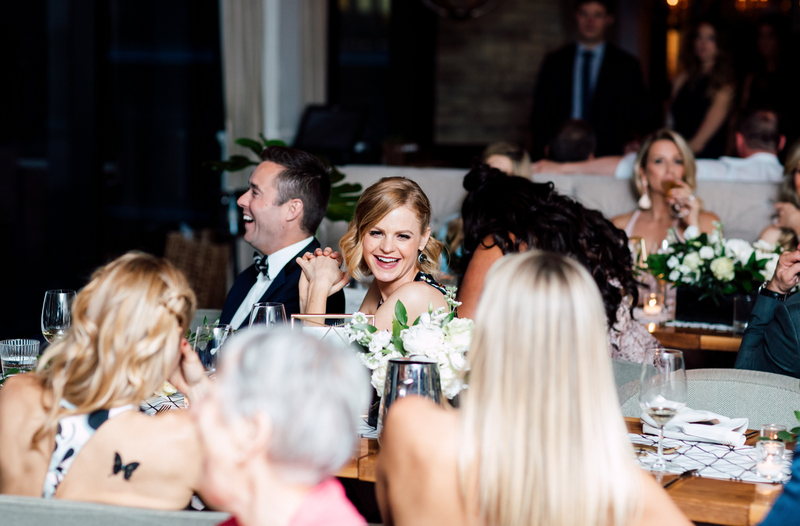 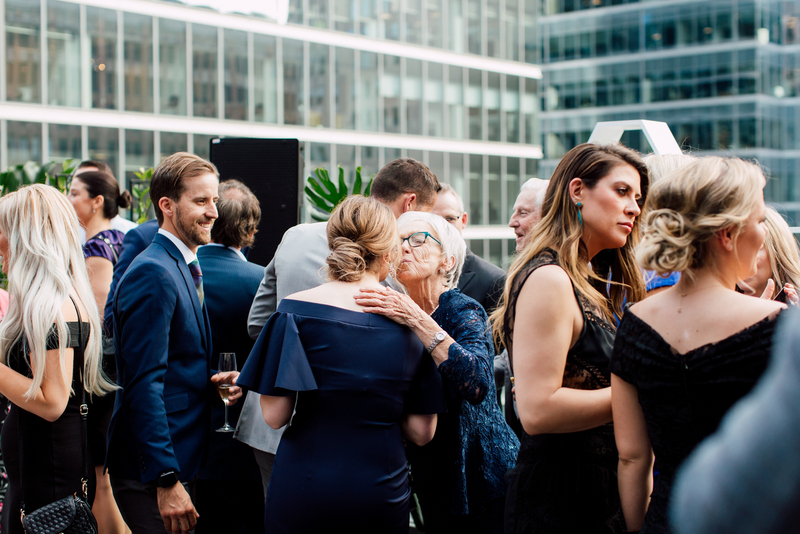 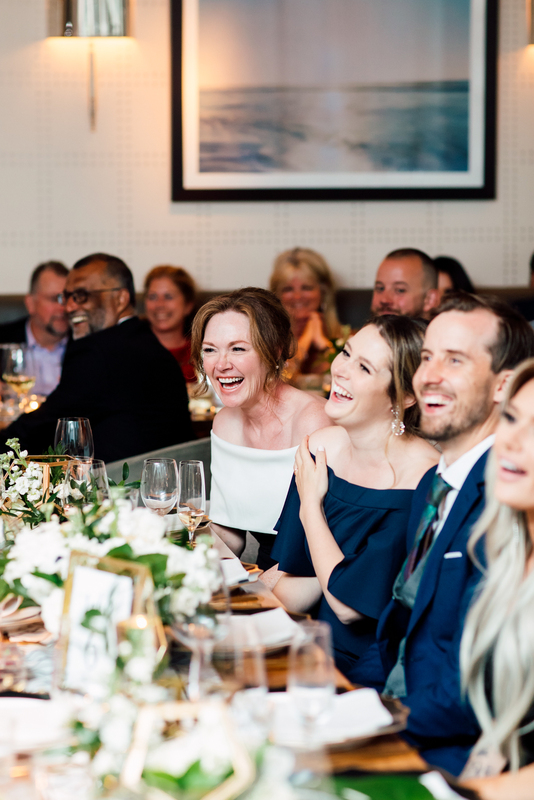 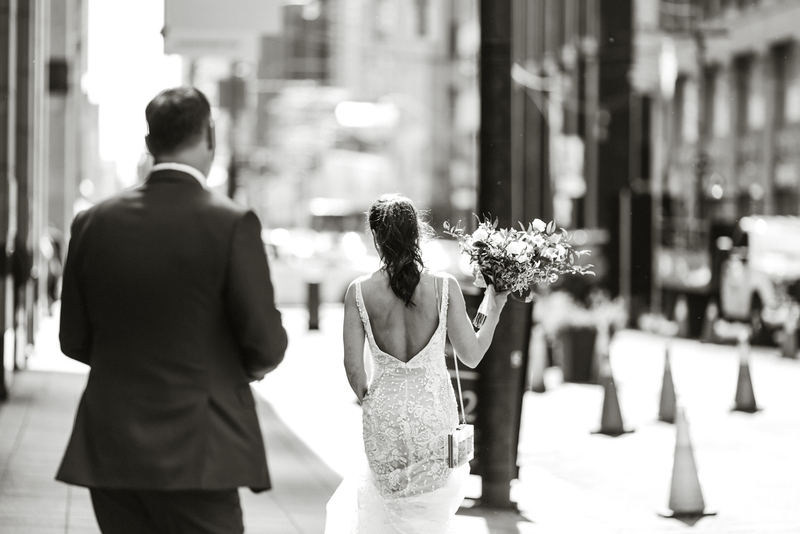 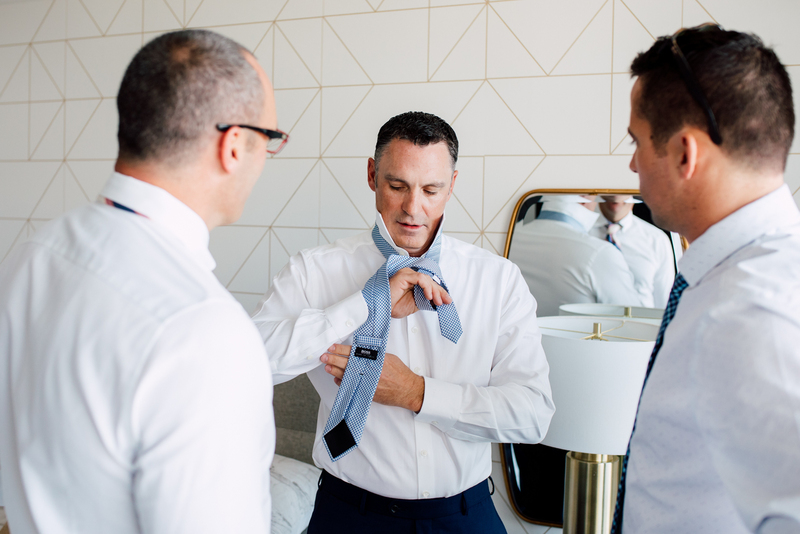 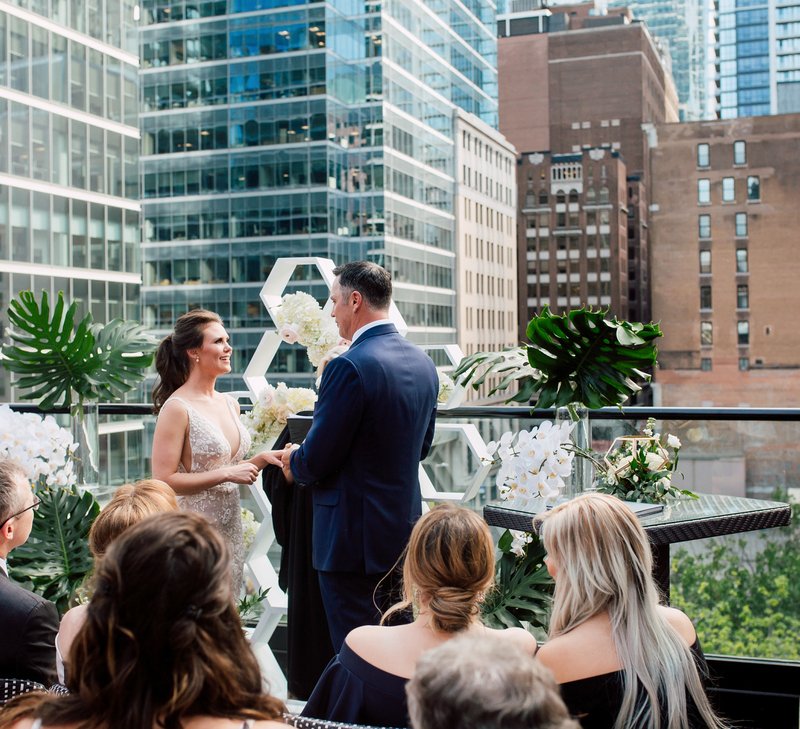 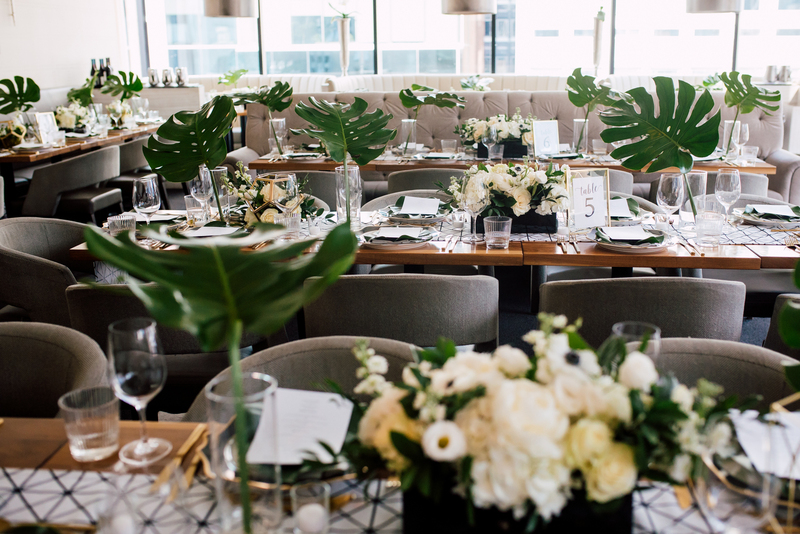 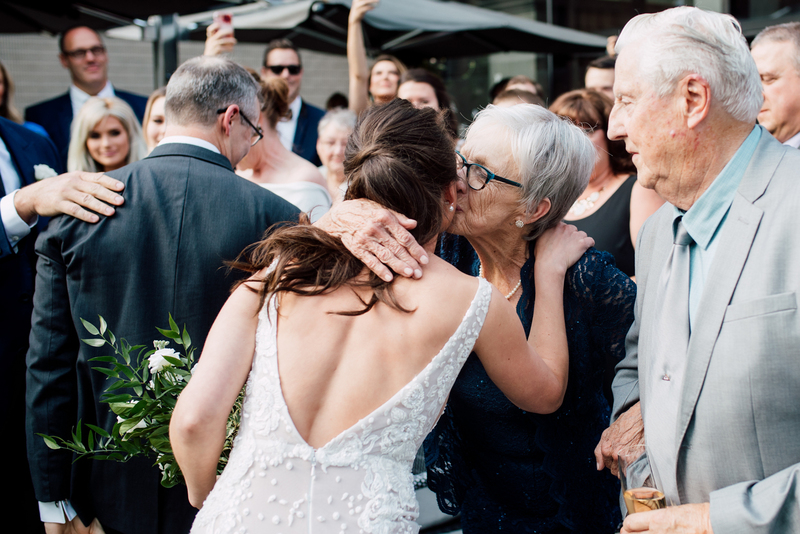 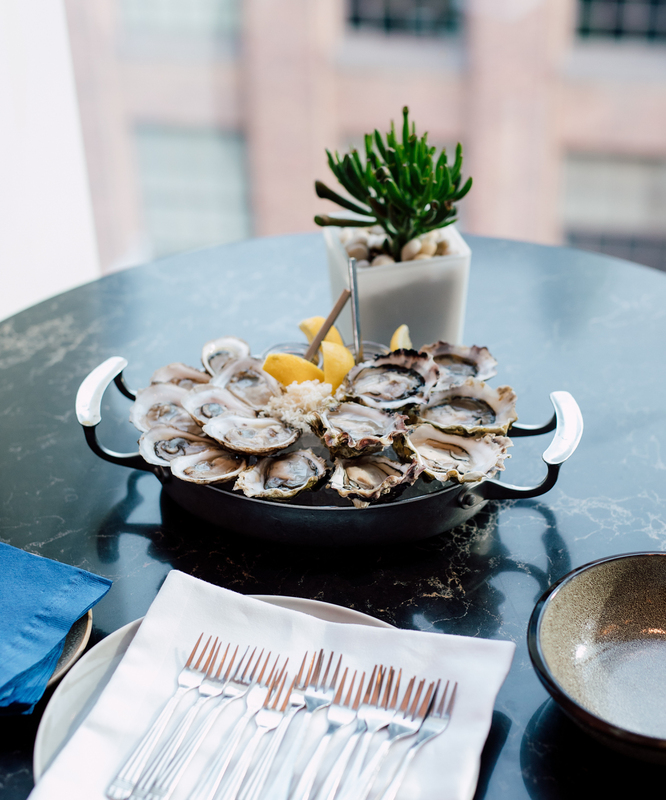 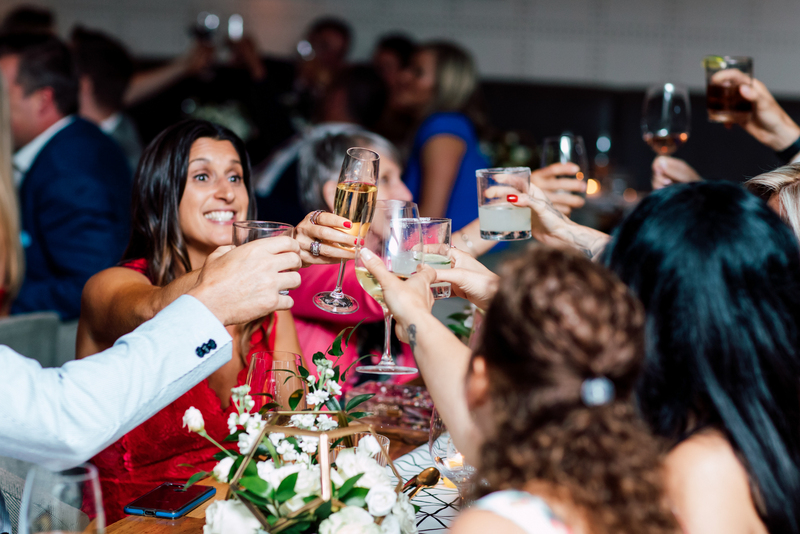 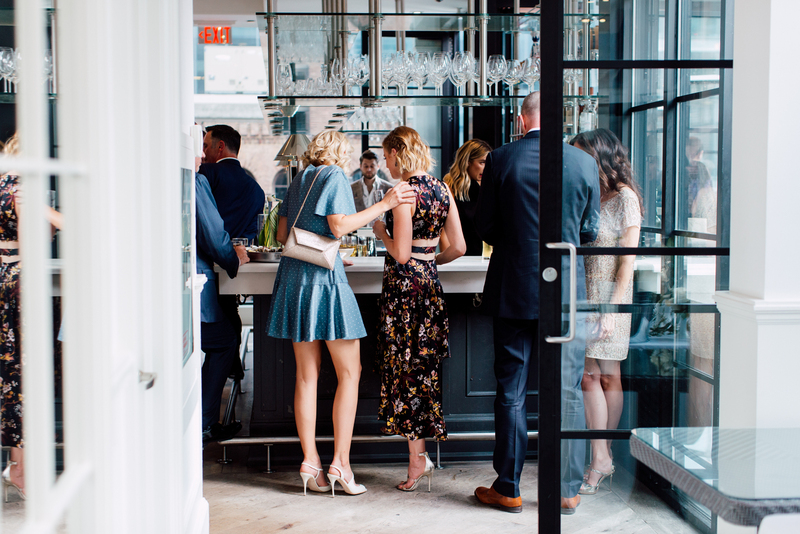 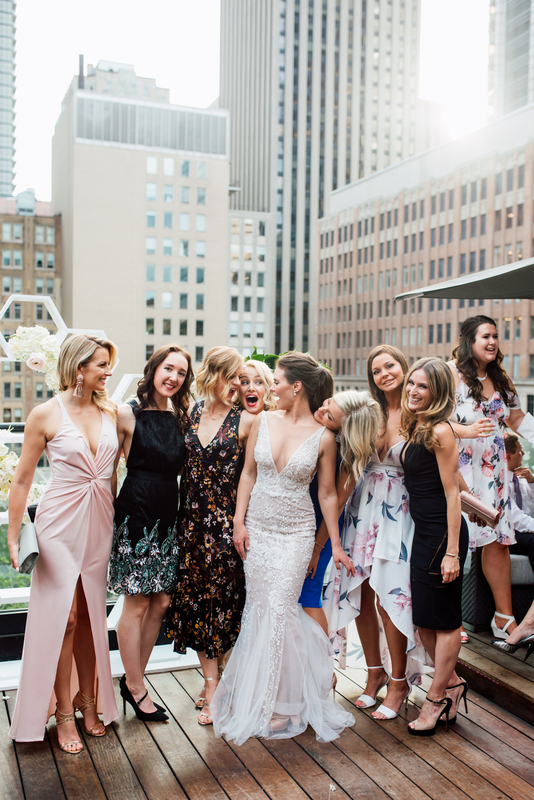 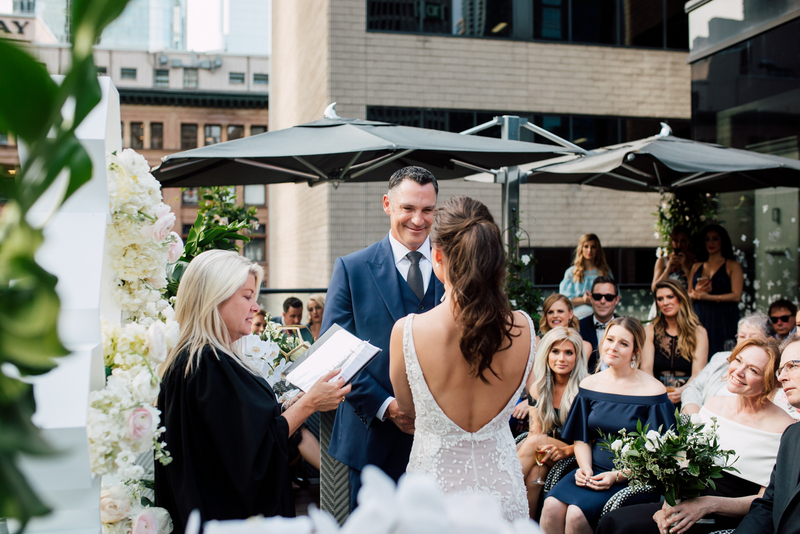 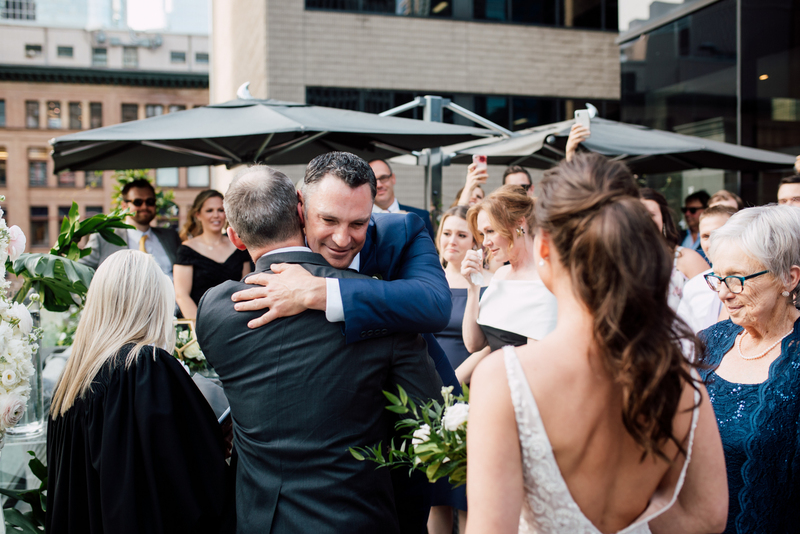 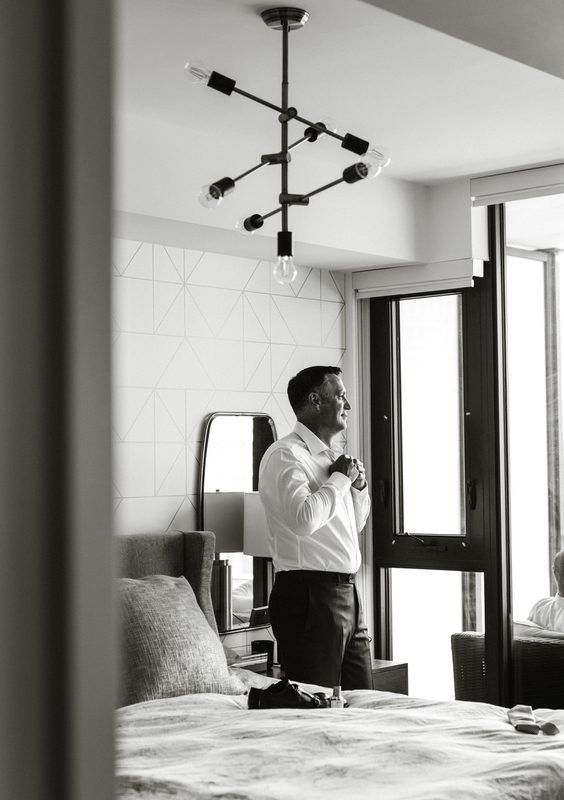 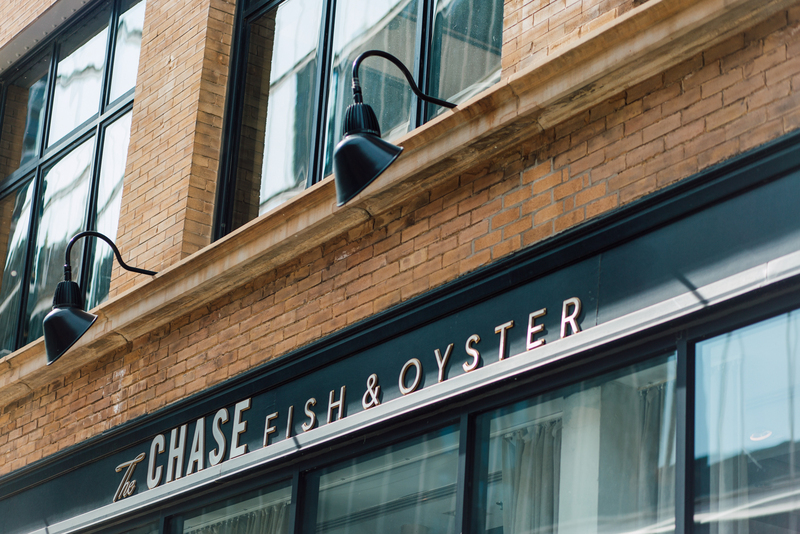 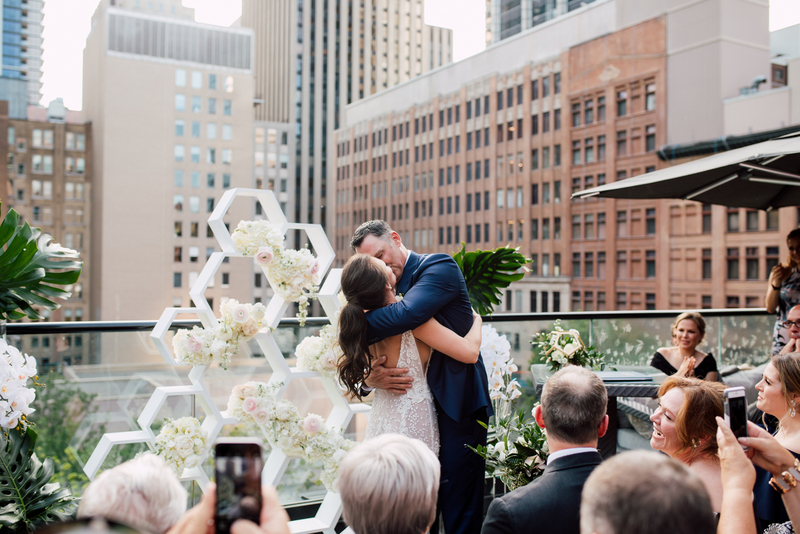 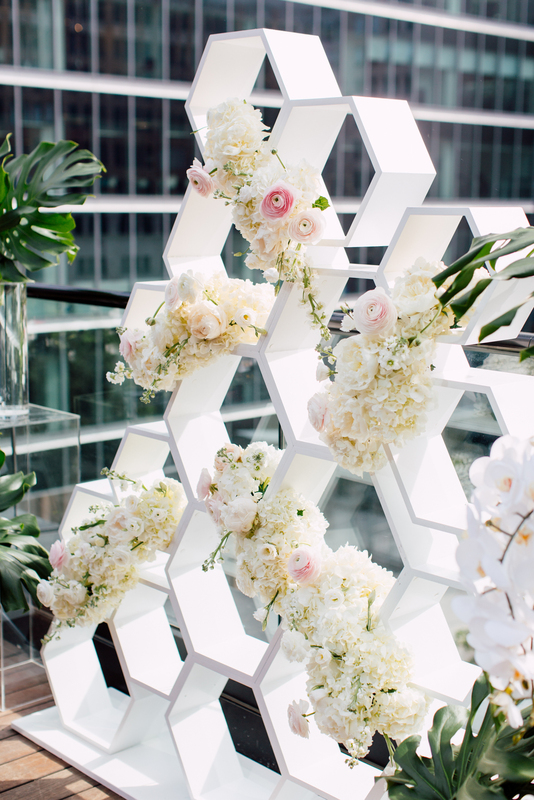 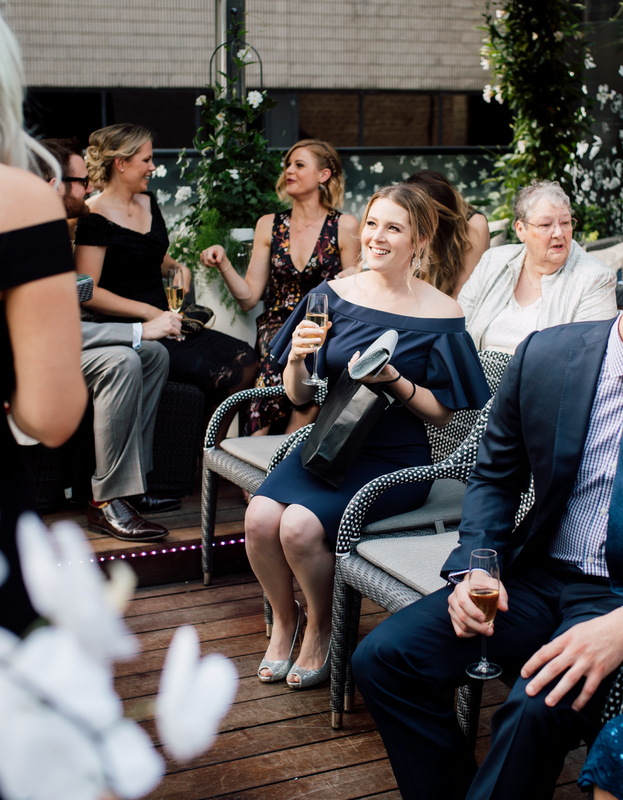 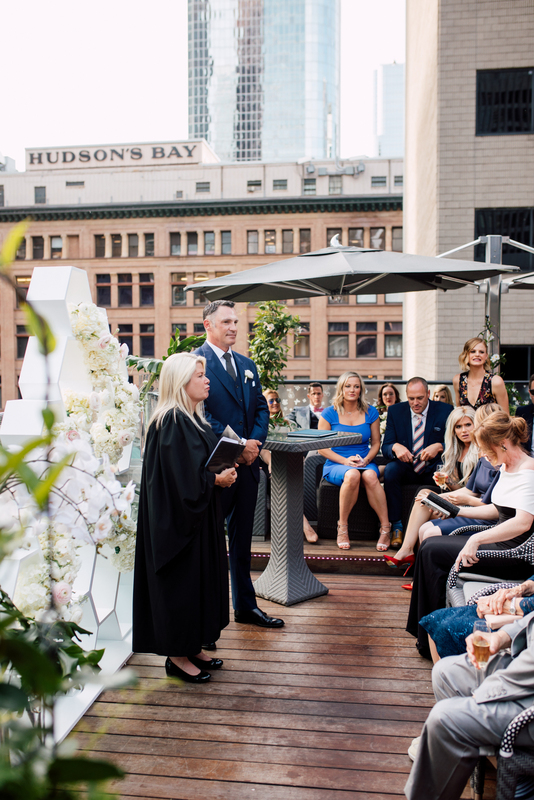 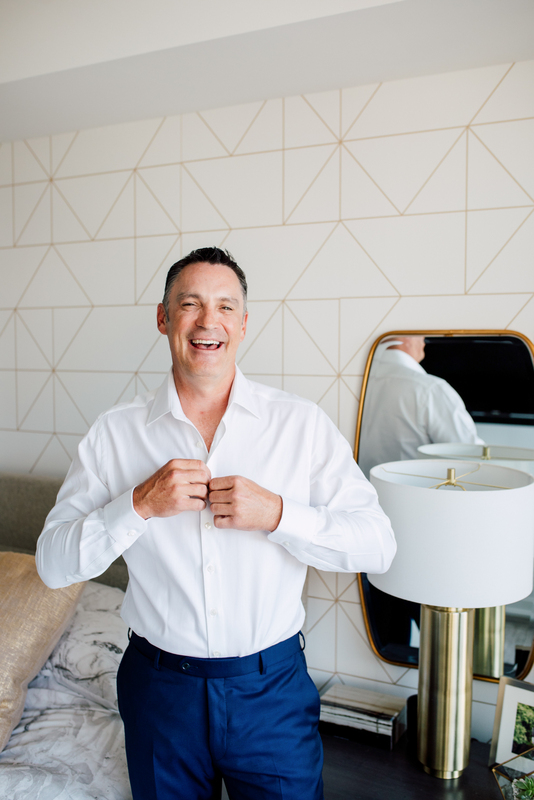 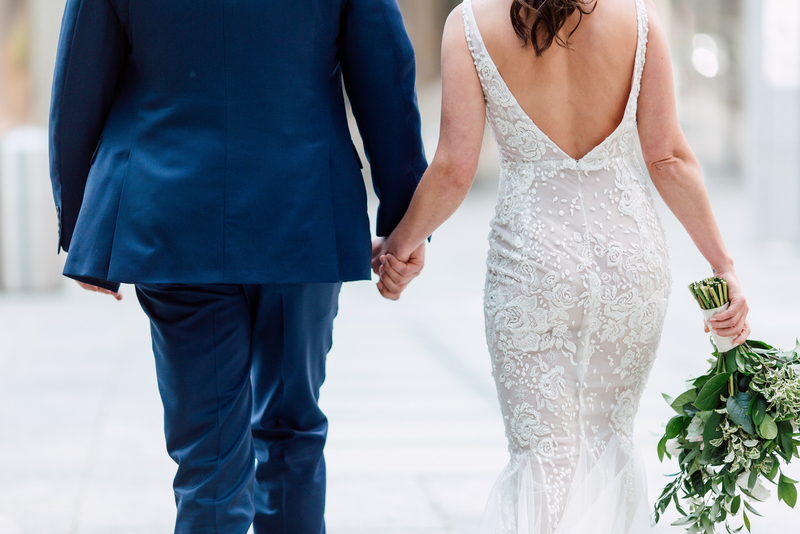 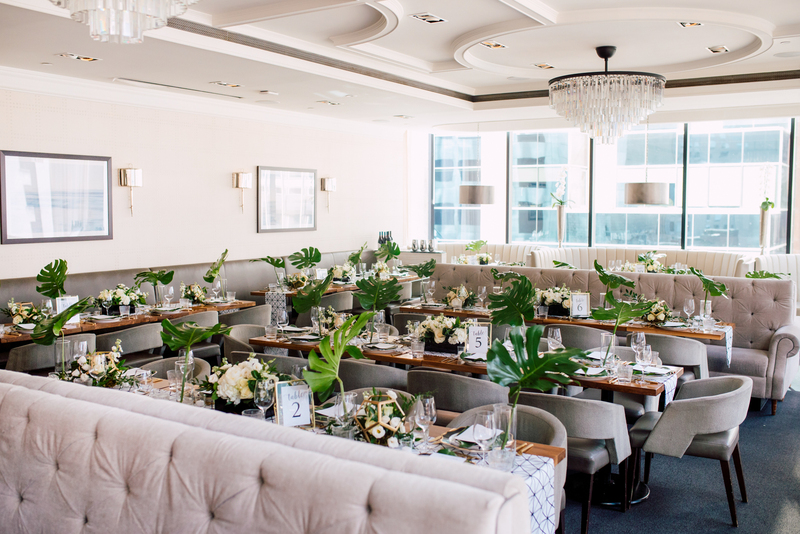 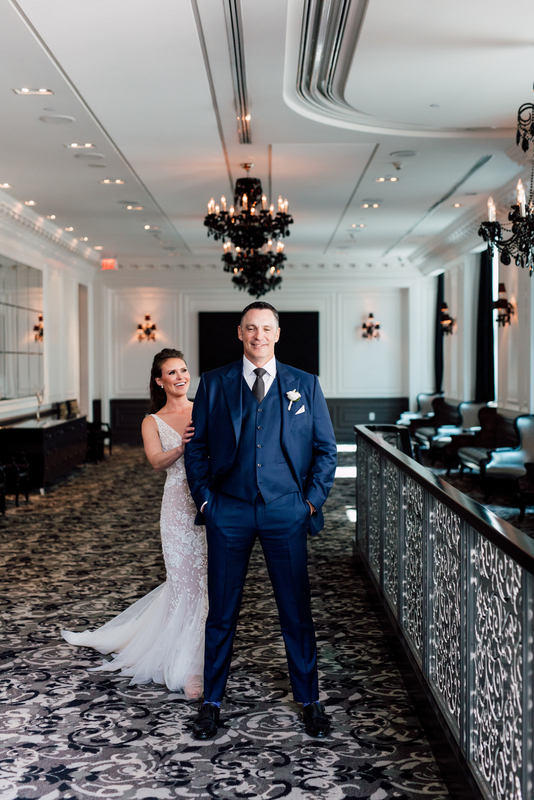 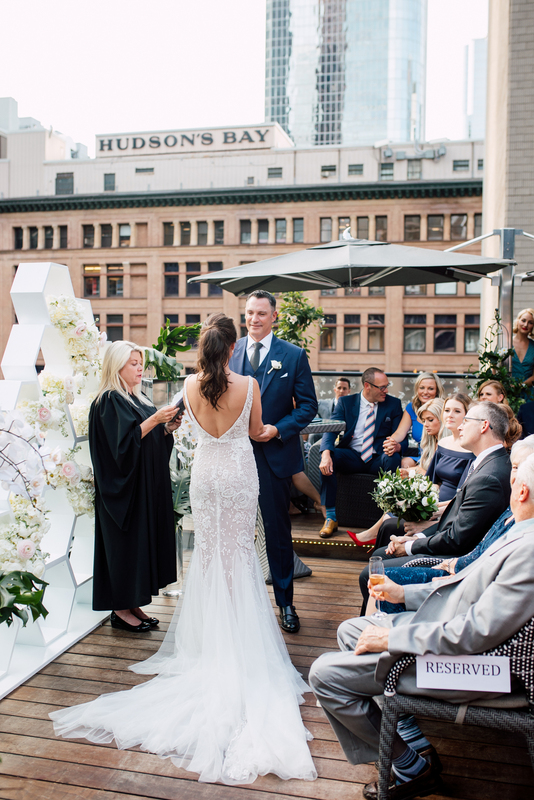 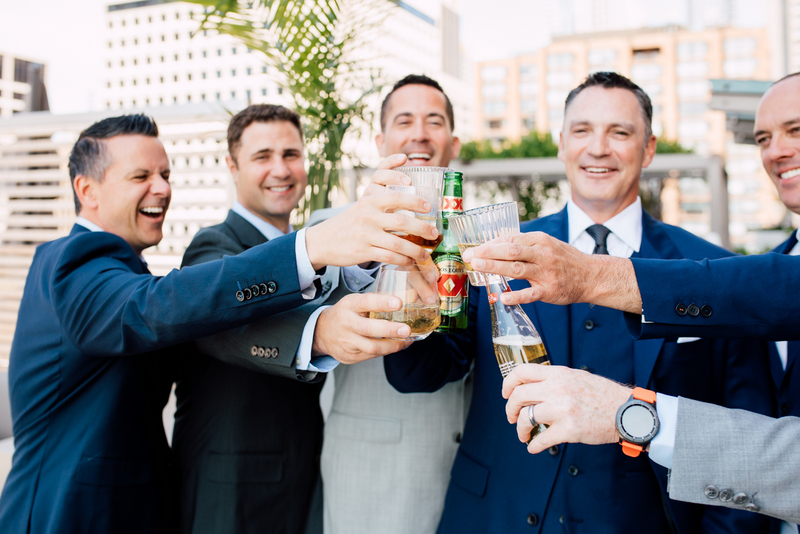 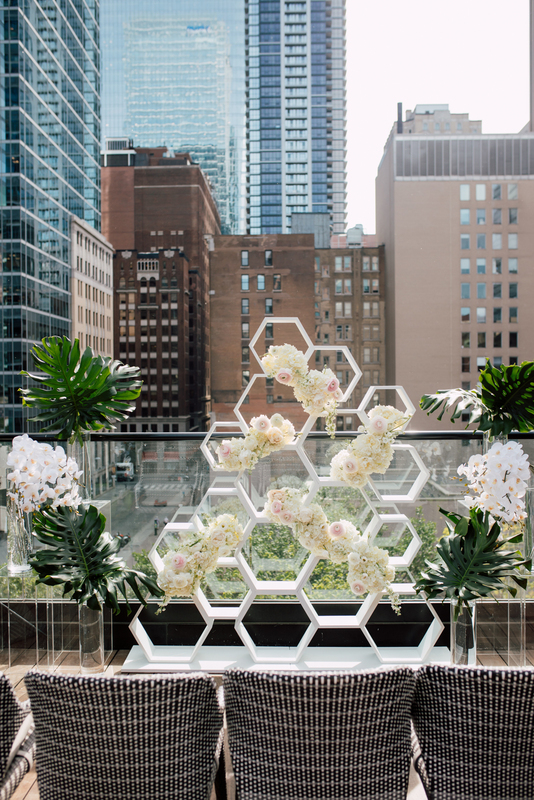 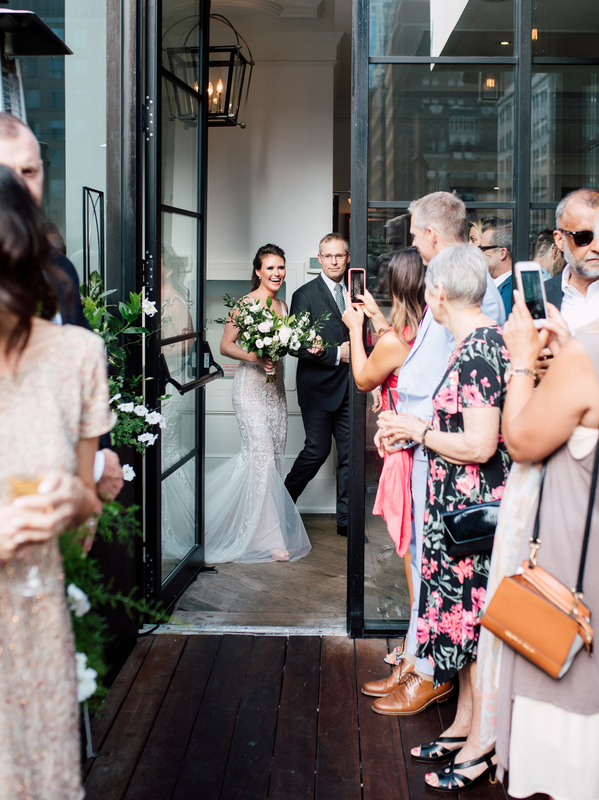 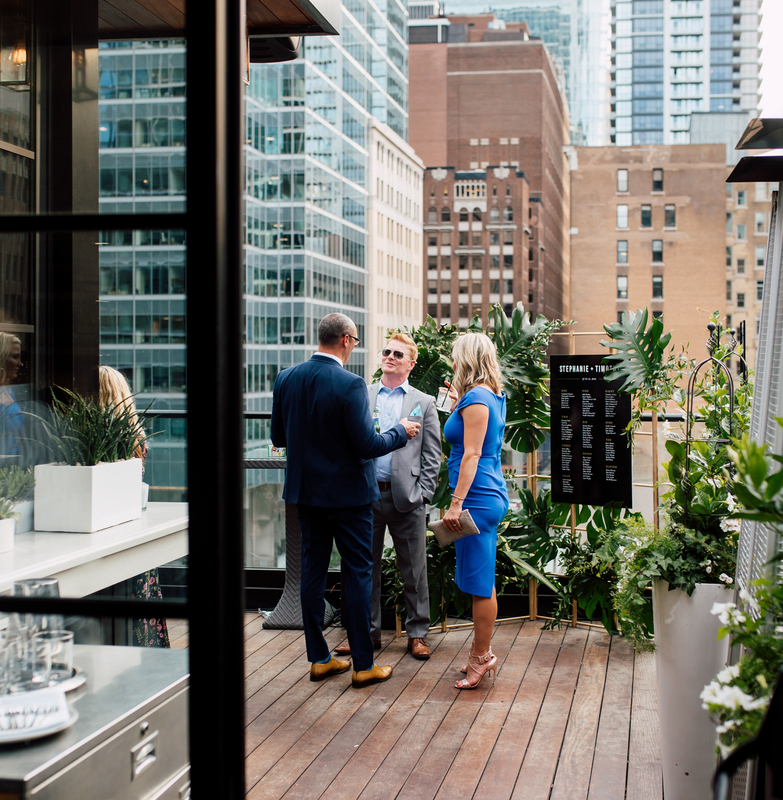 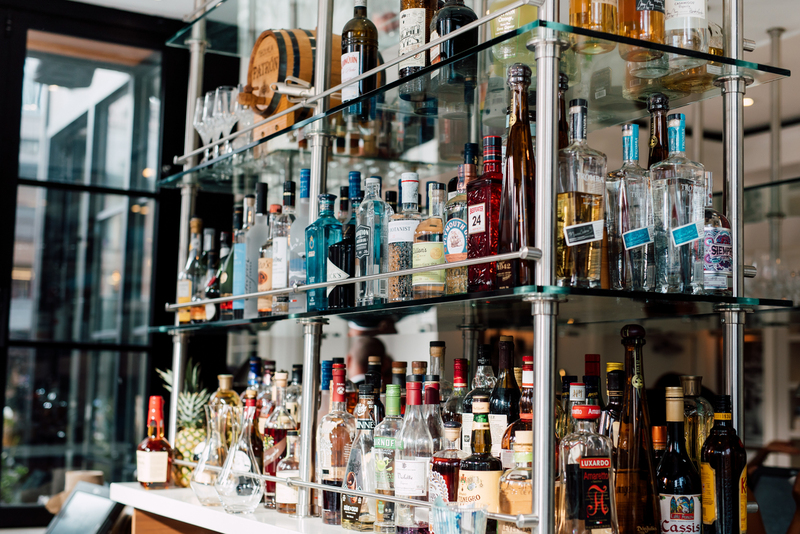 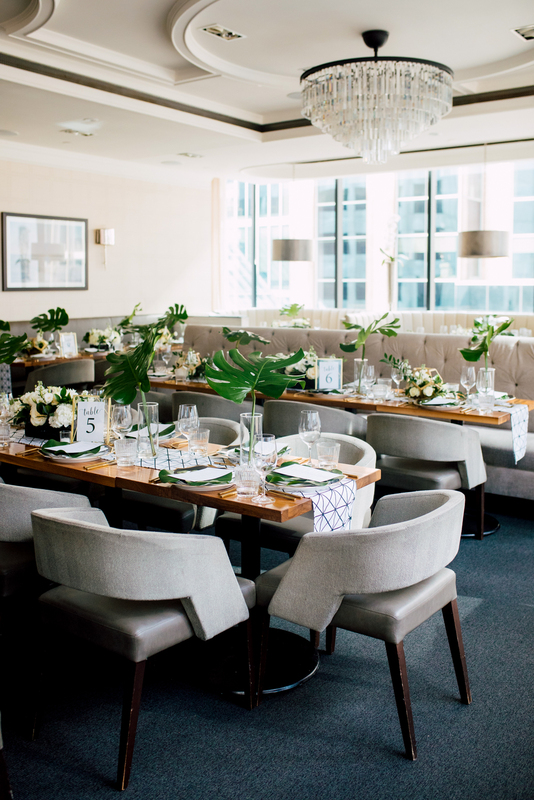 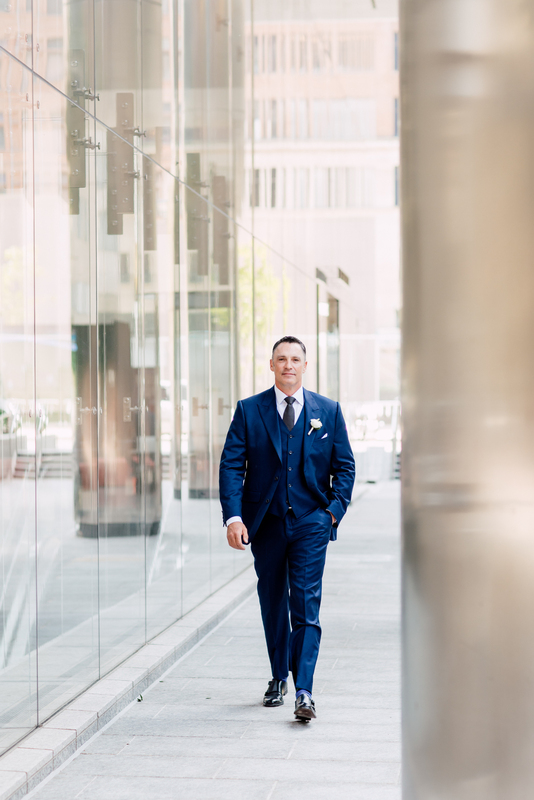 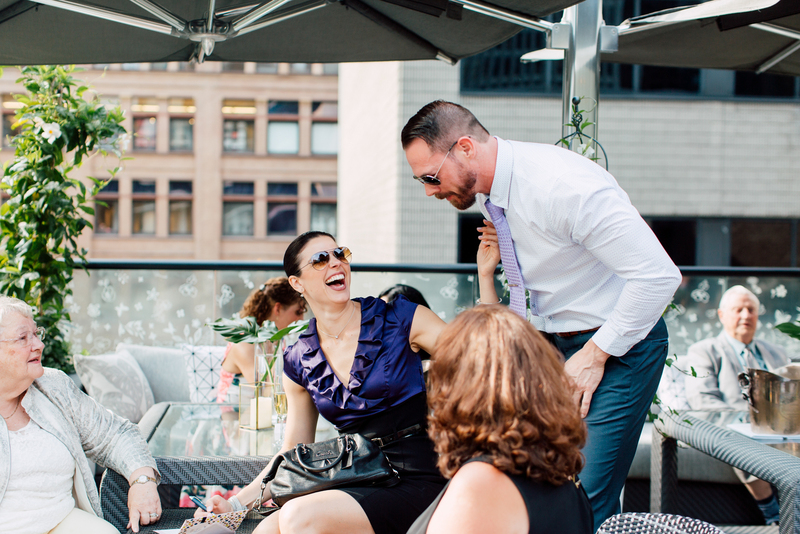 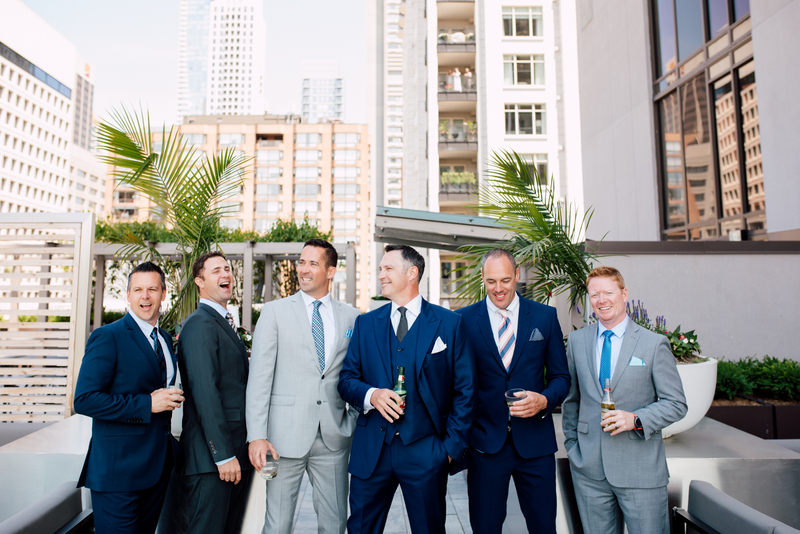 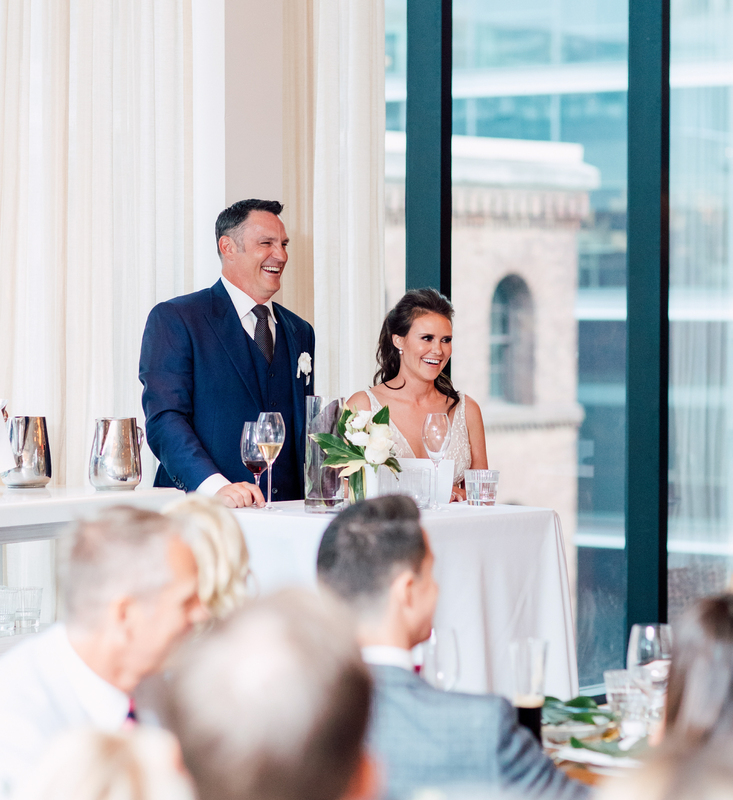 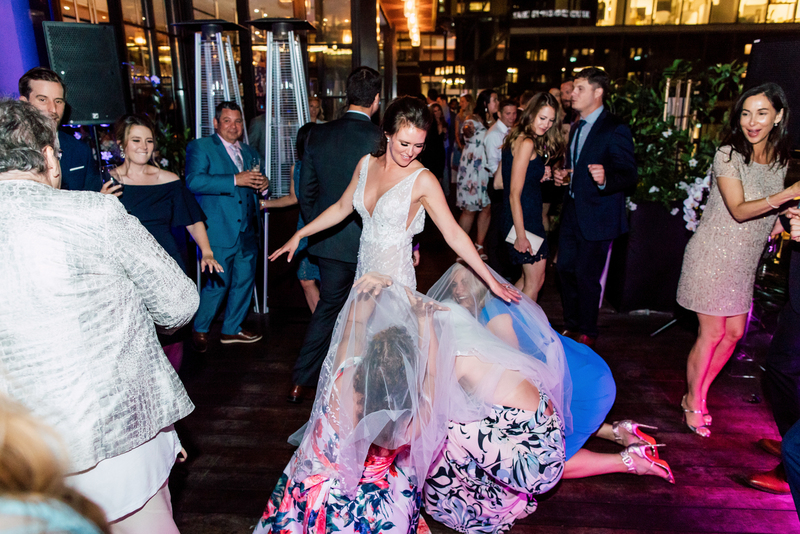 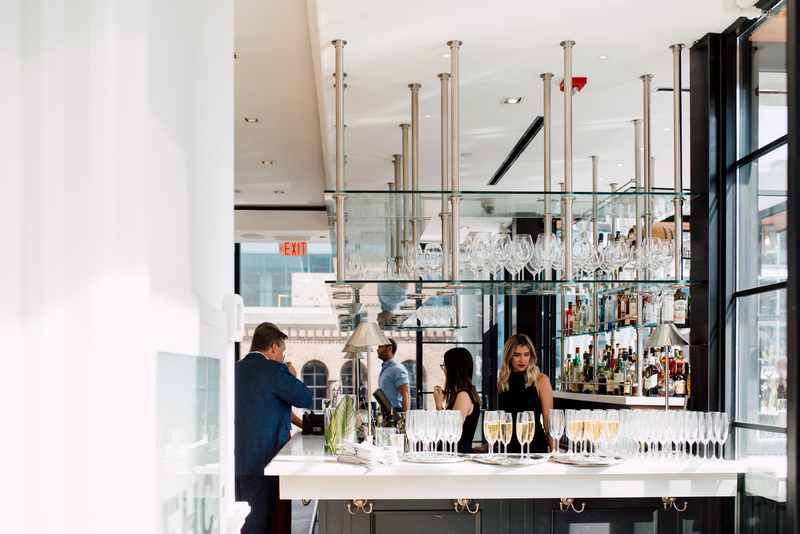 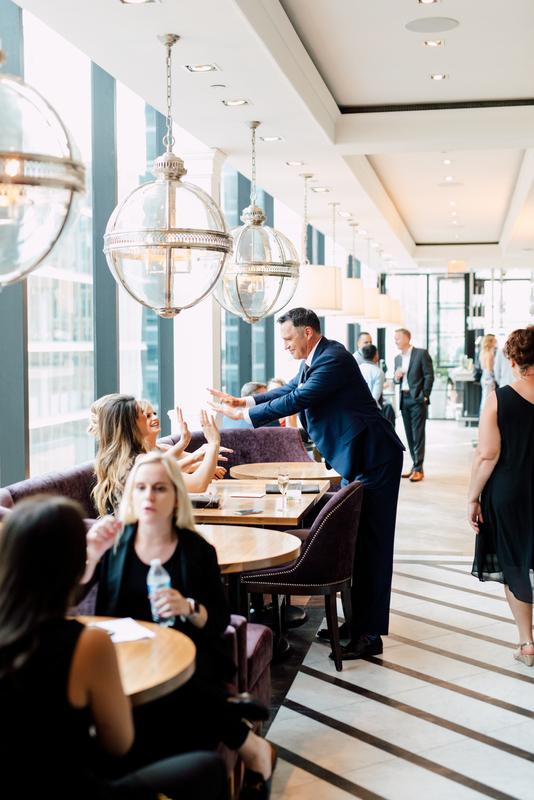 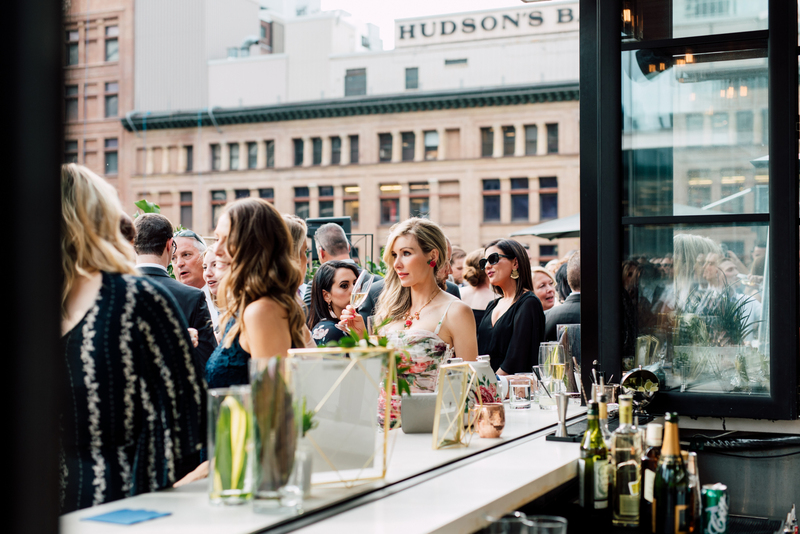 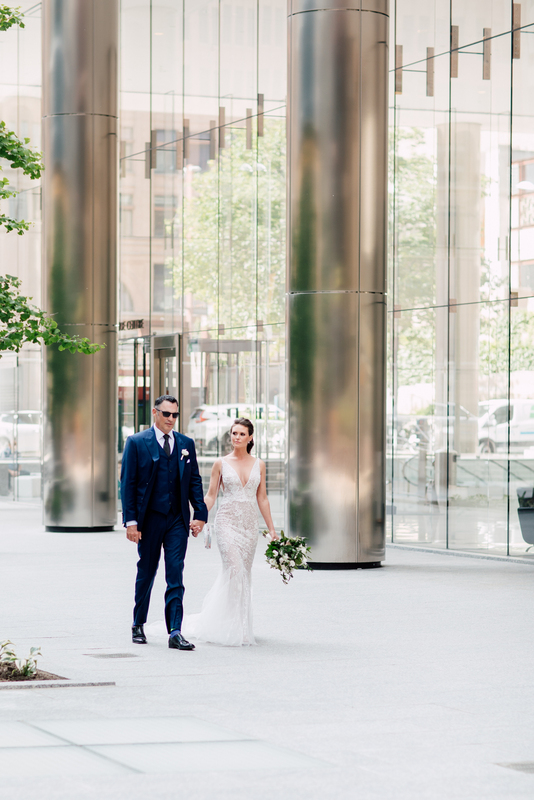 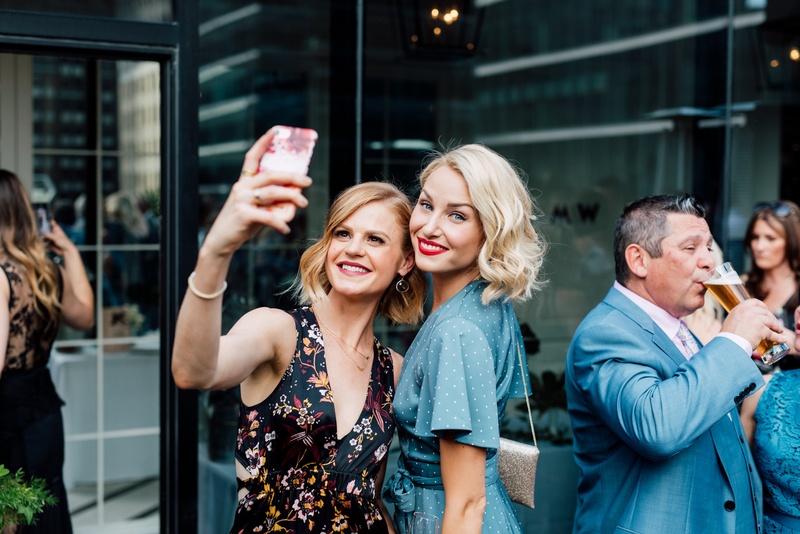 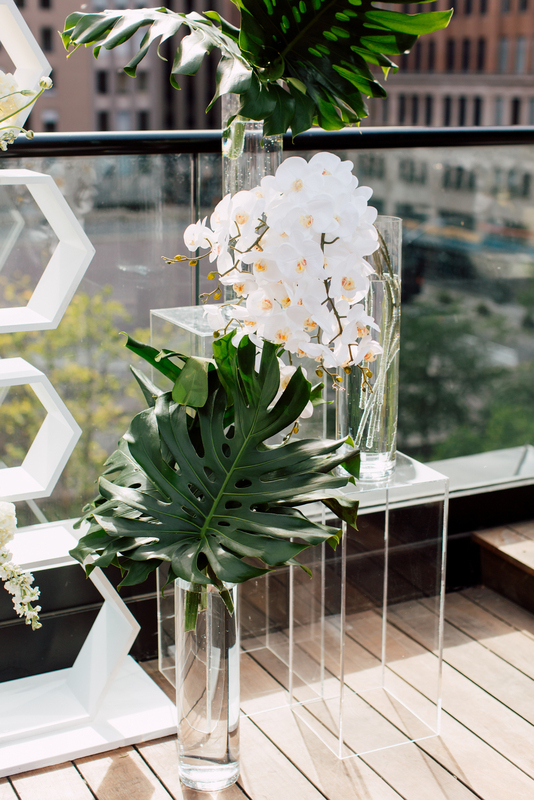 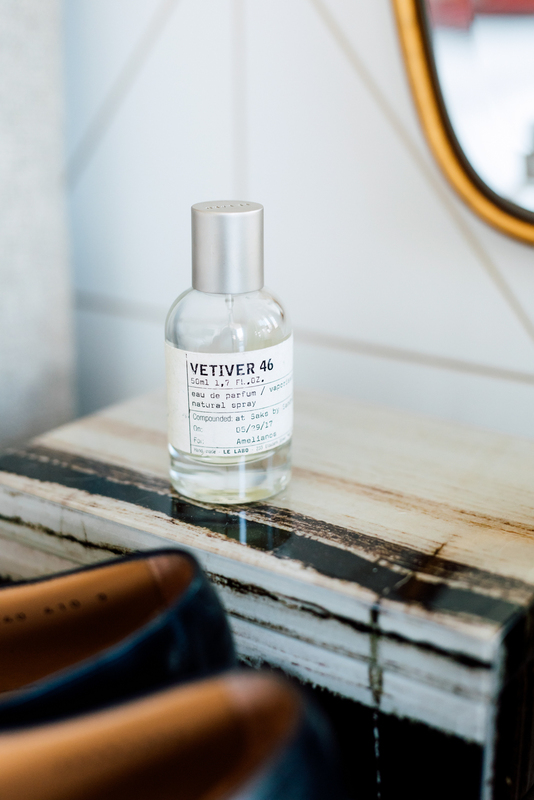 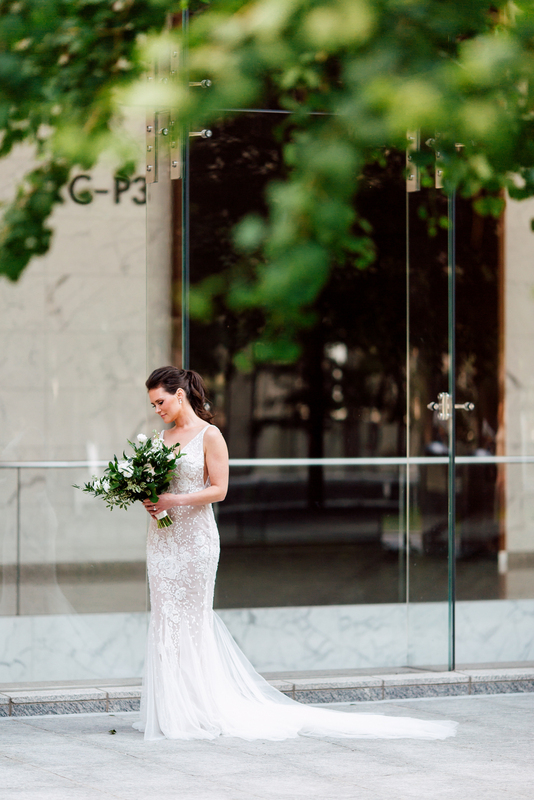 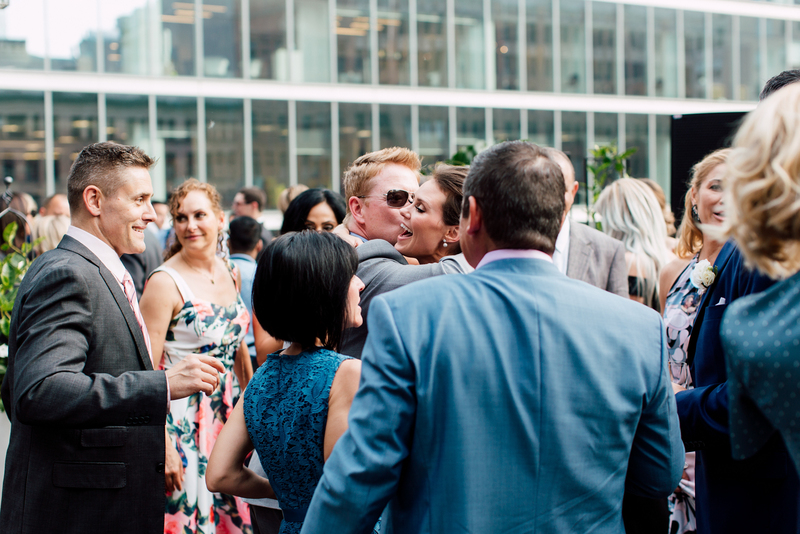 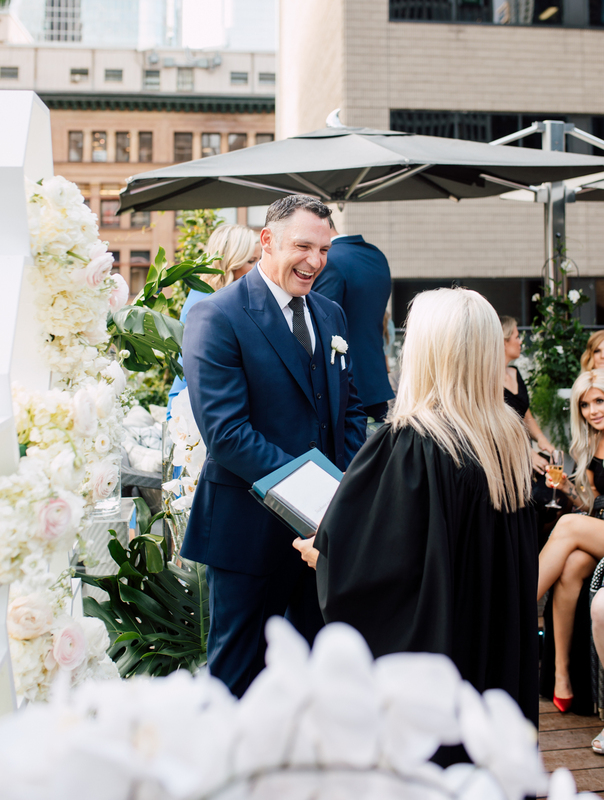 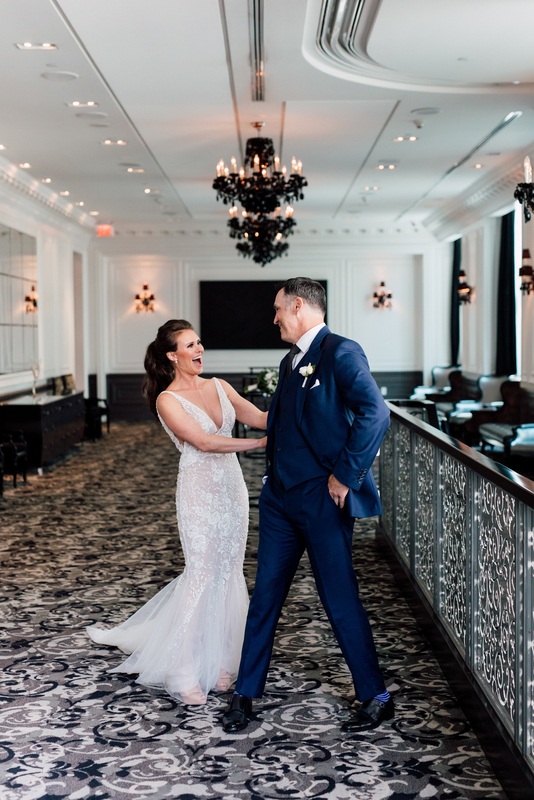 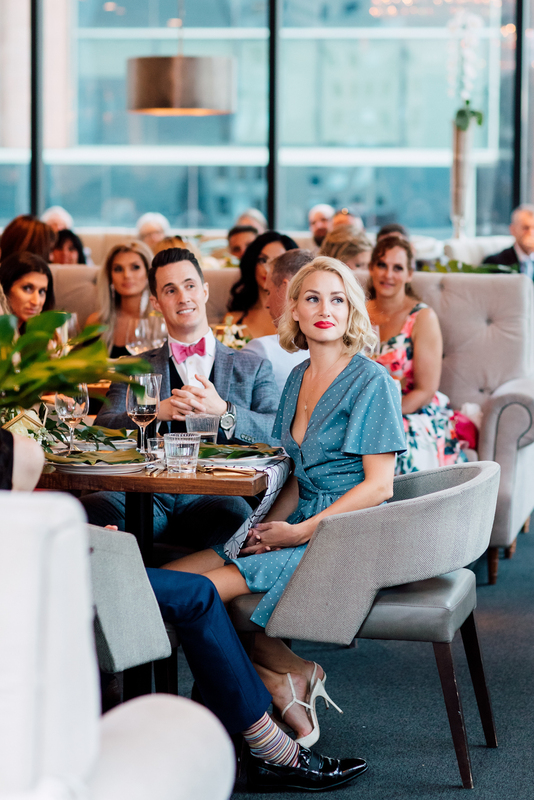 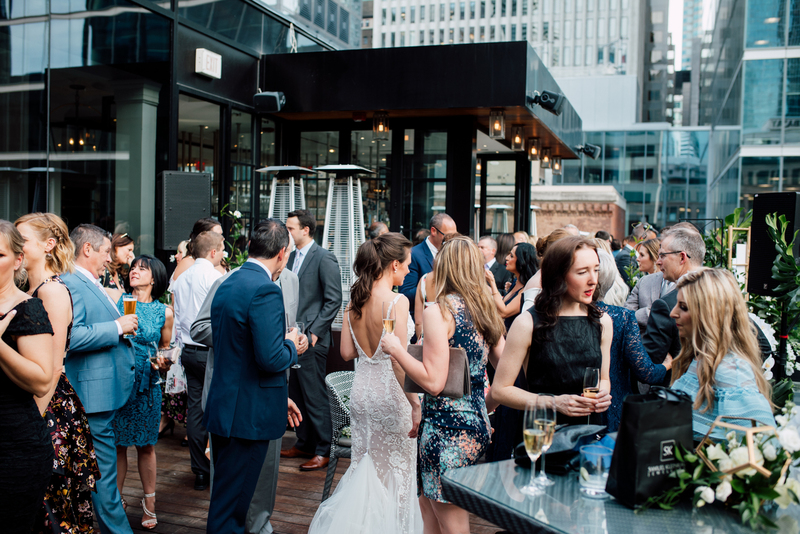 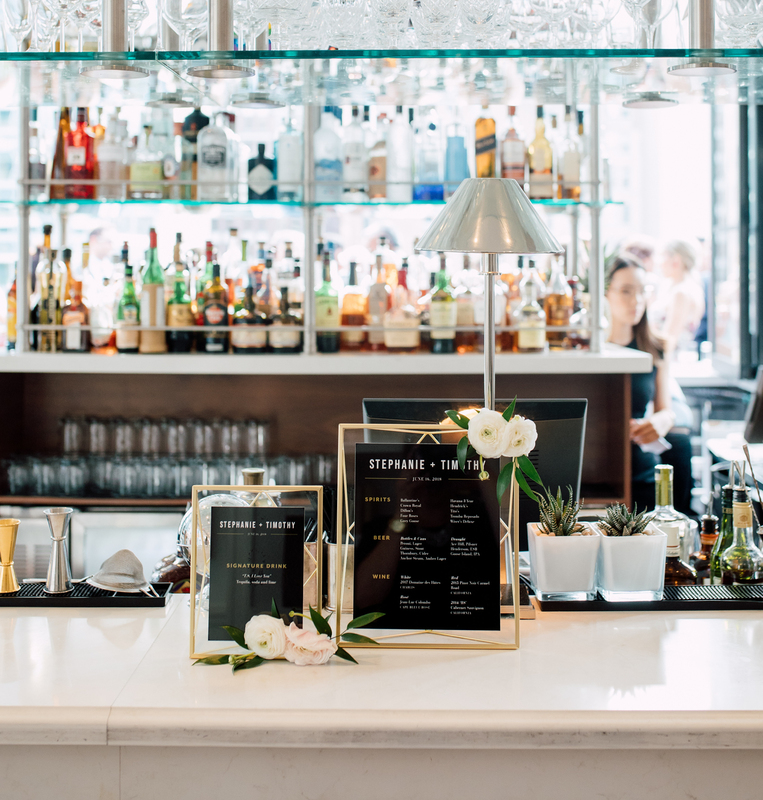 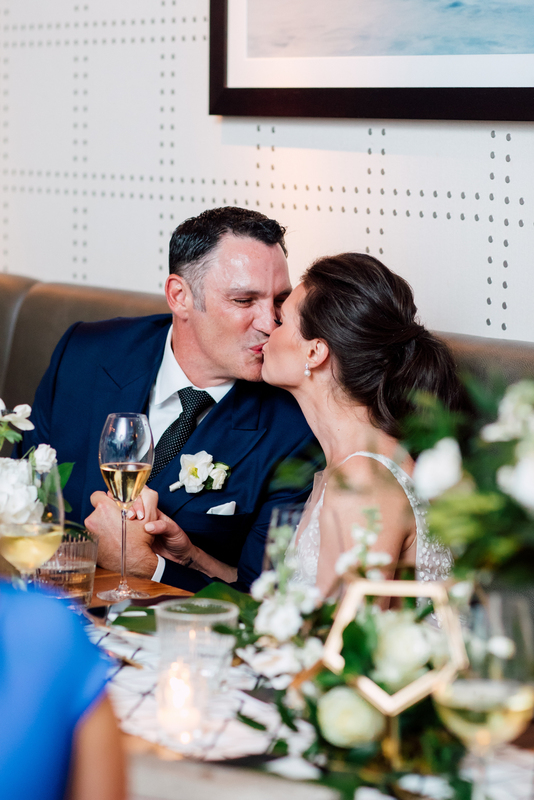 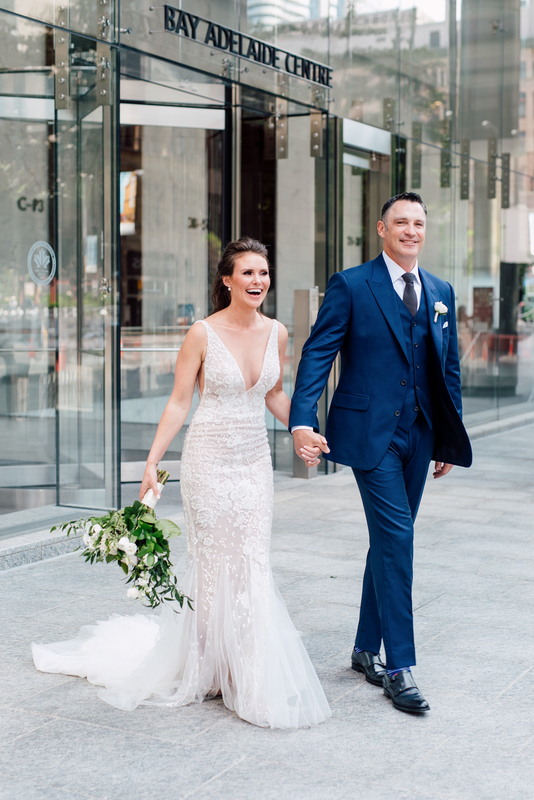 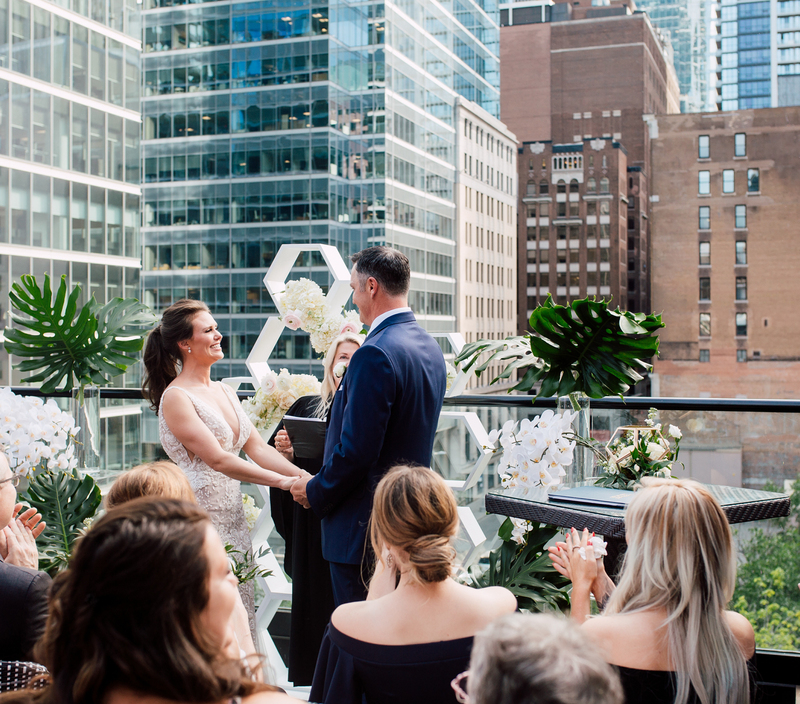 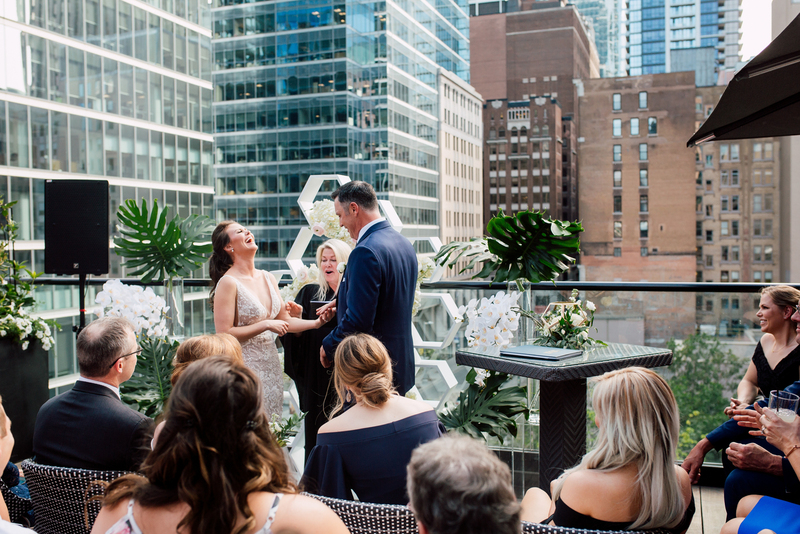 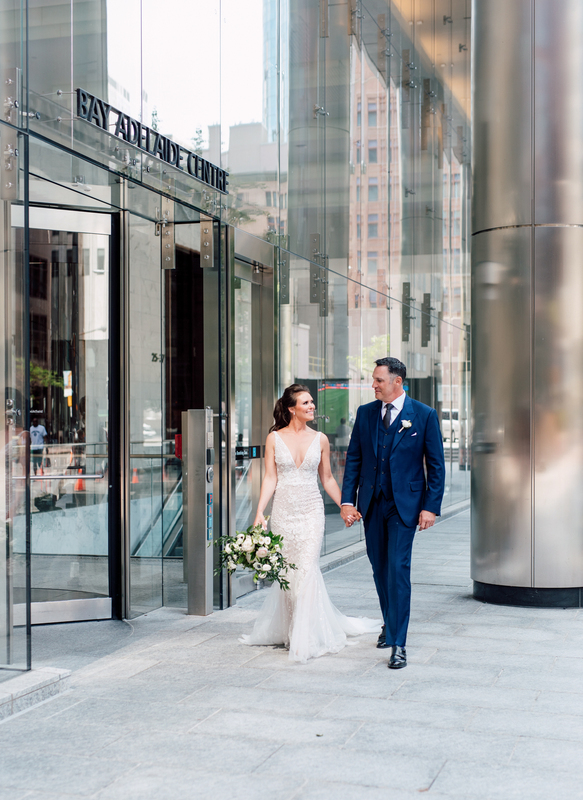 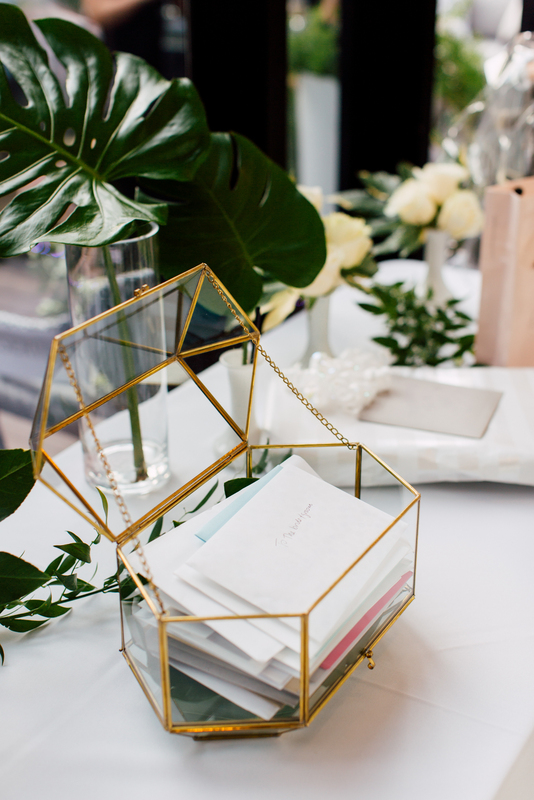 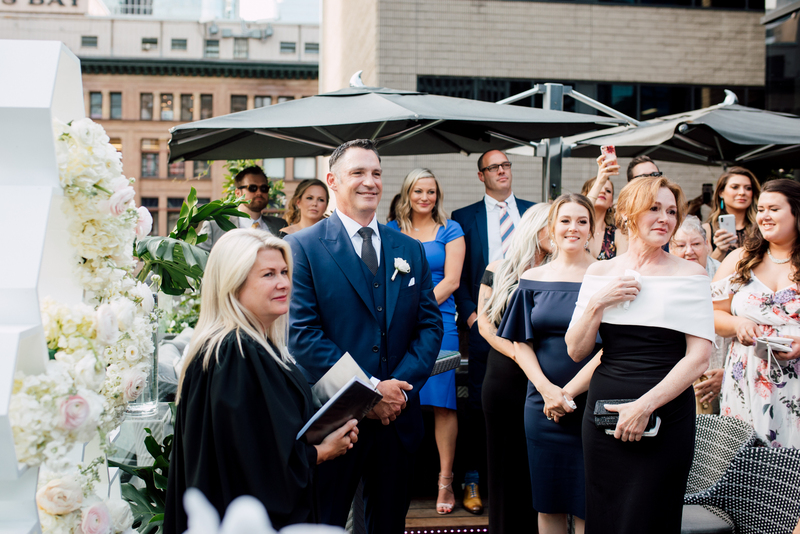 Held in downtown Toronto at The Chase, this summer wedding tied together modern geometric city style with tropical greenery. 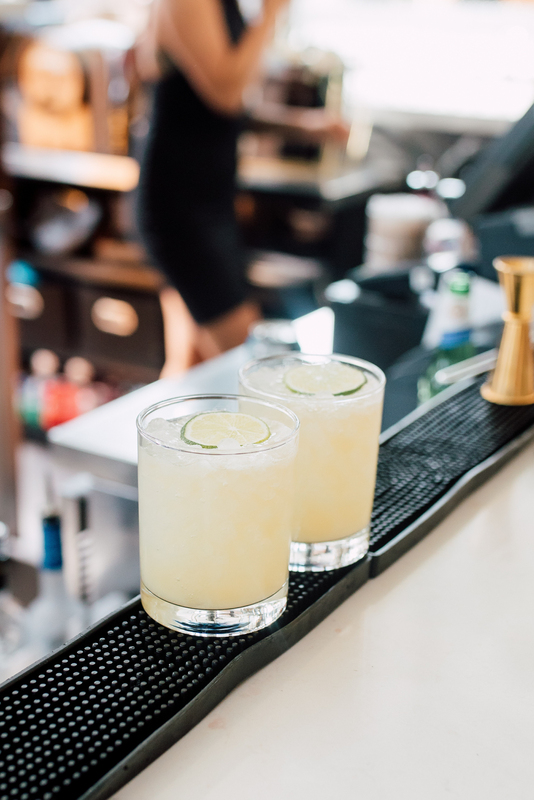 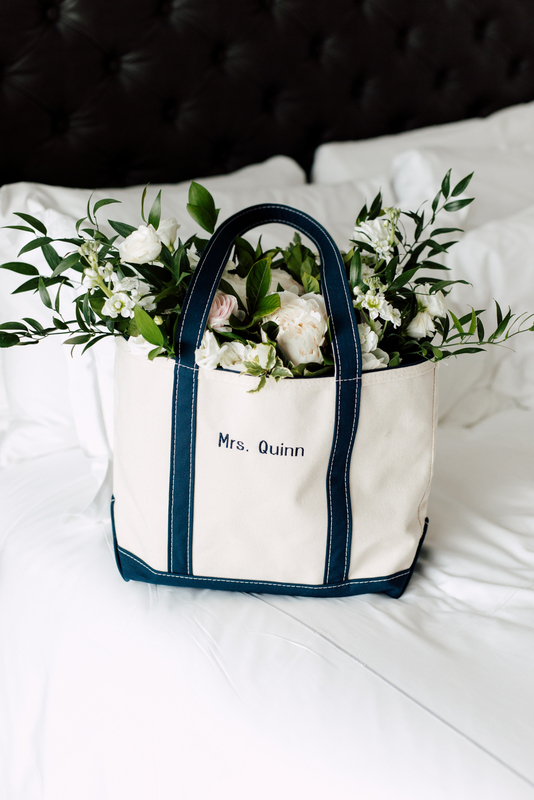 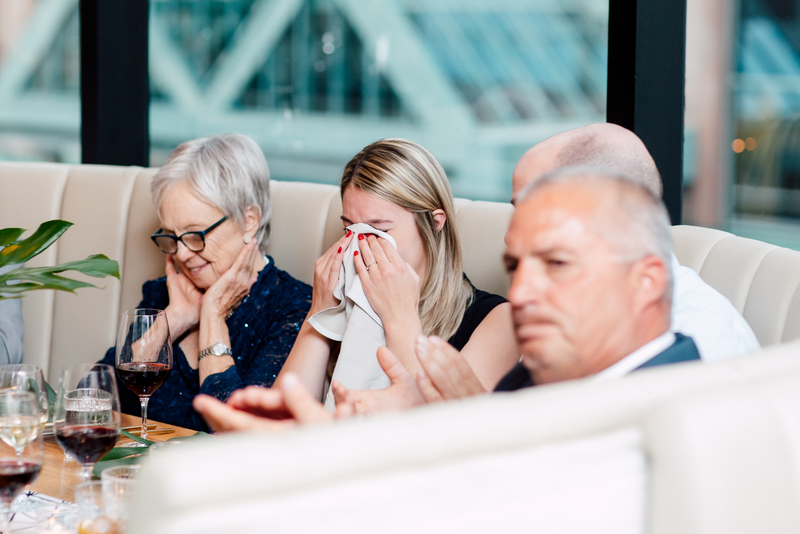 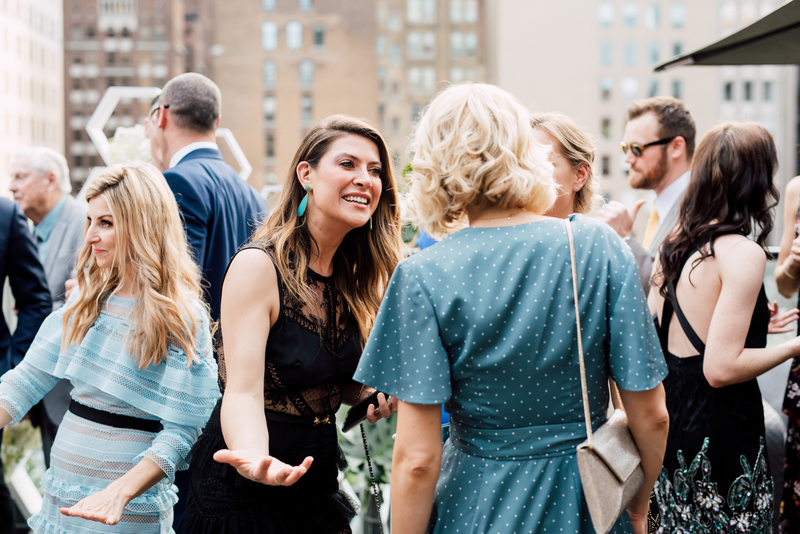 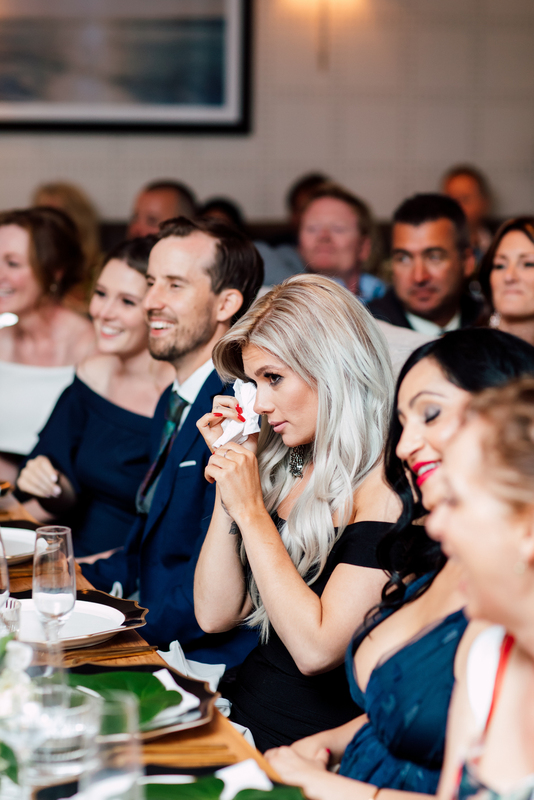 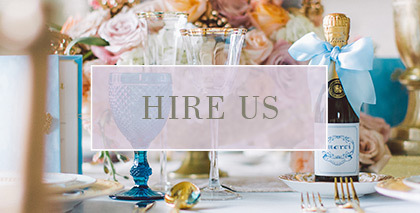 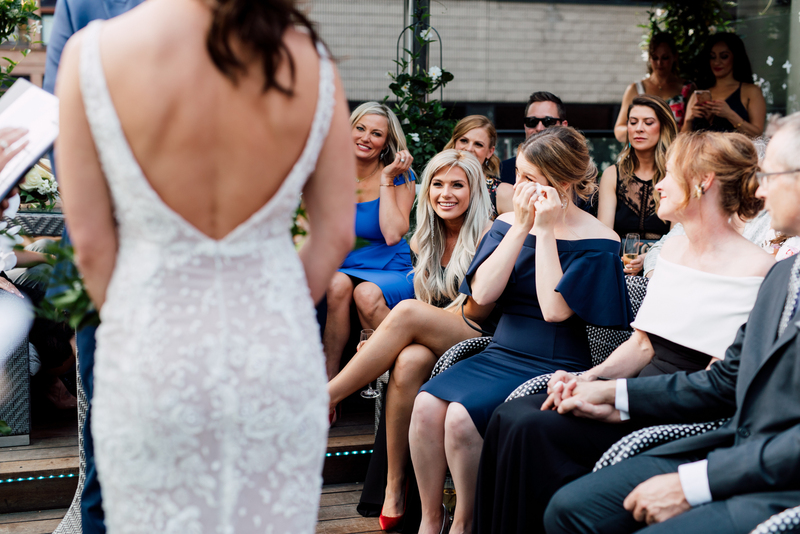 Opting not to have a wedding party, their day was inclusive of all of their guests, creating an intimate and relaxed atmosphere. 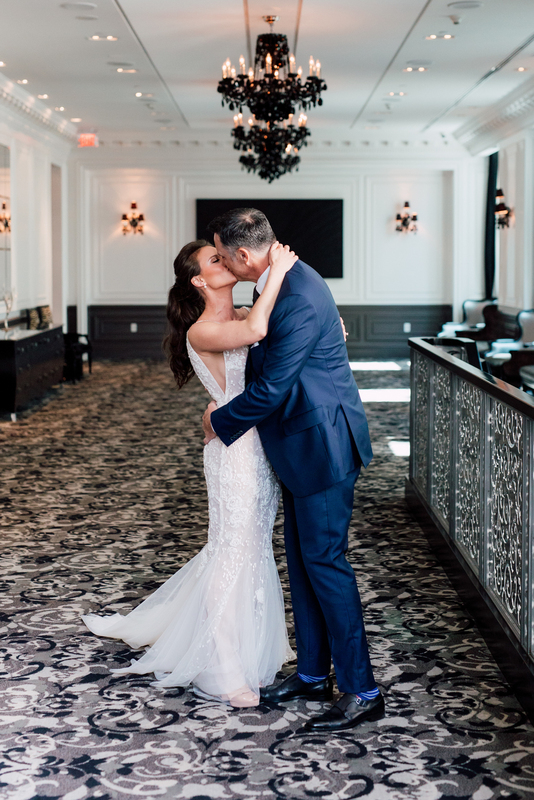 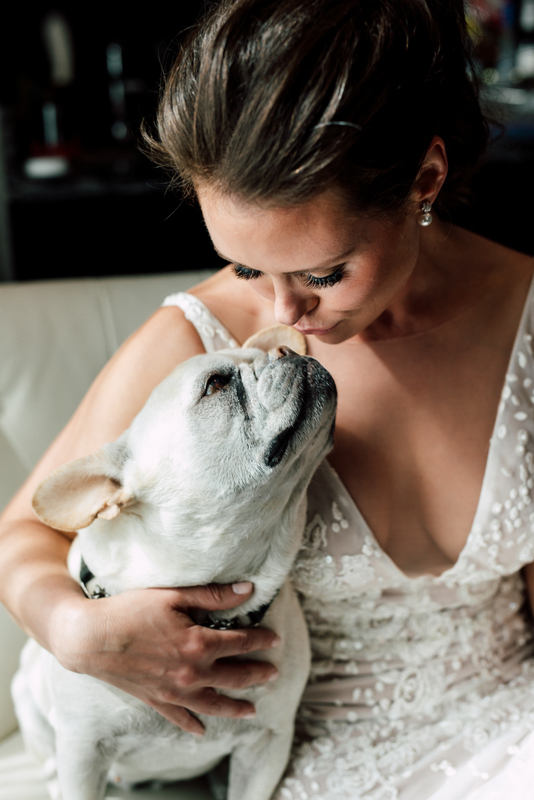 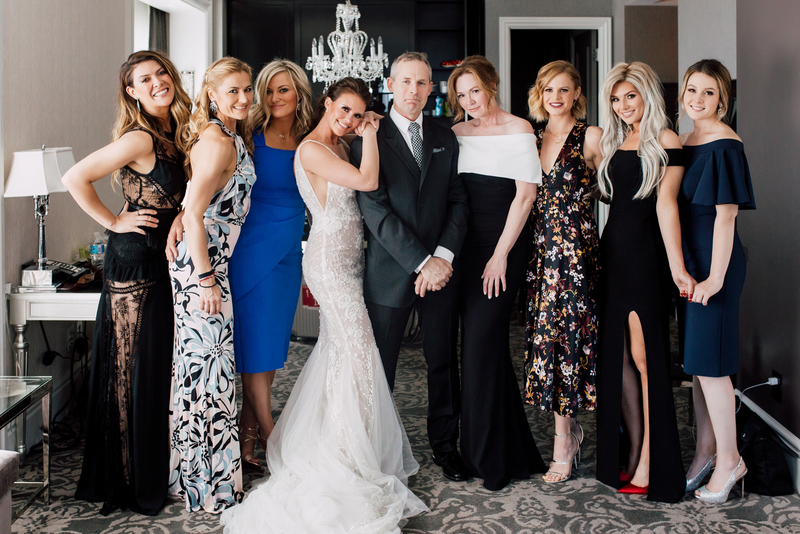 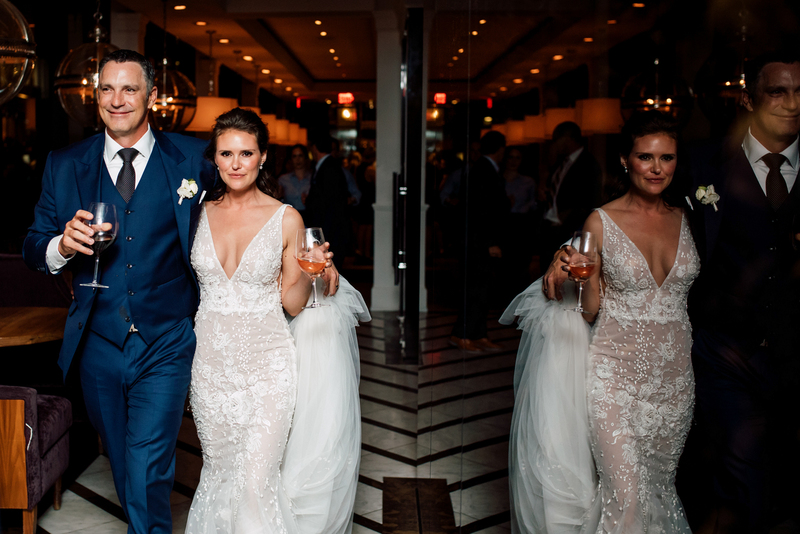 Stephanie looked breathtaking in her Leah Da Gloria gown. 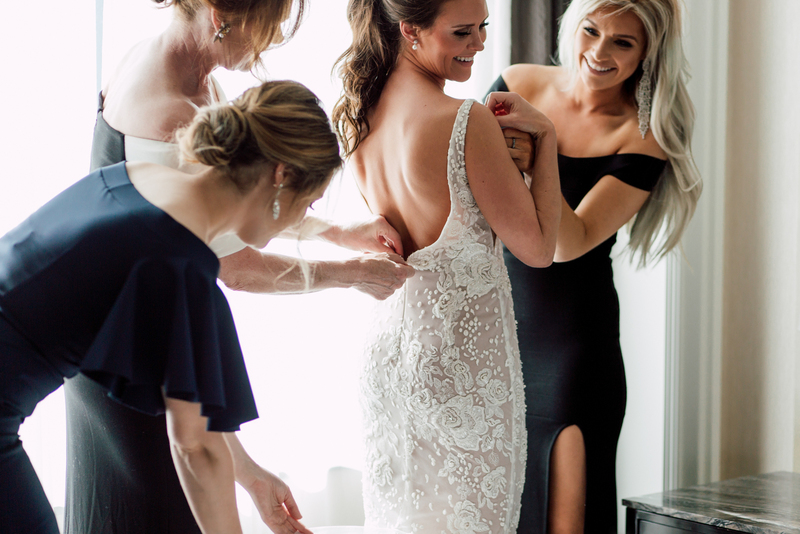 The contemporary fitted gown had incredible intricate detailing and her laid-back ponytail was the perfect complement to her natural look. 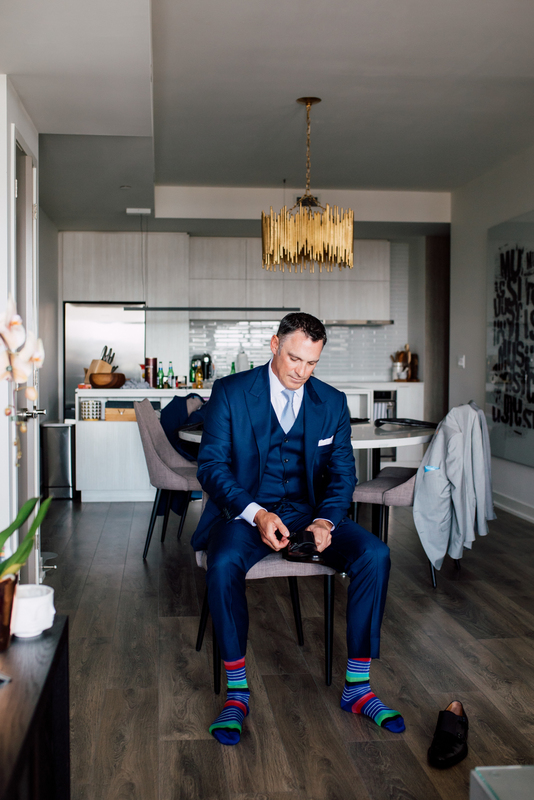 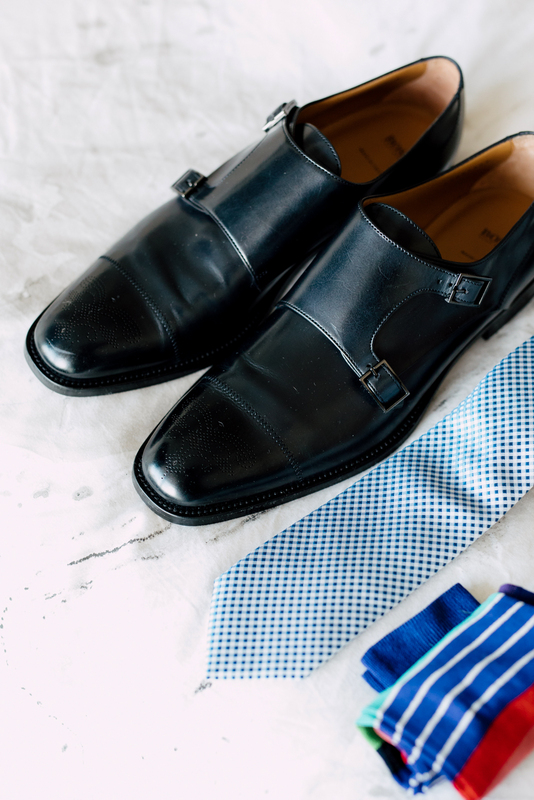 We love Timothy’s colourful striped socks, a playful detail to accessorize his sharp suit. 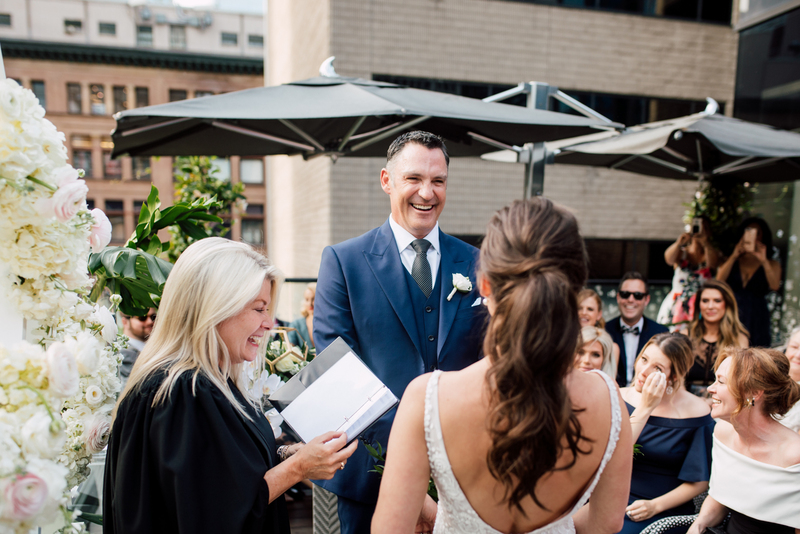 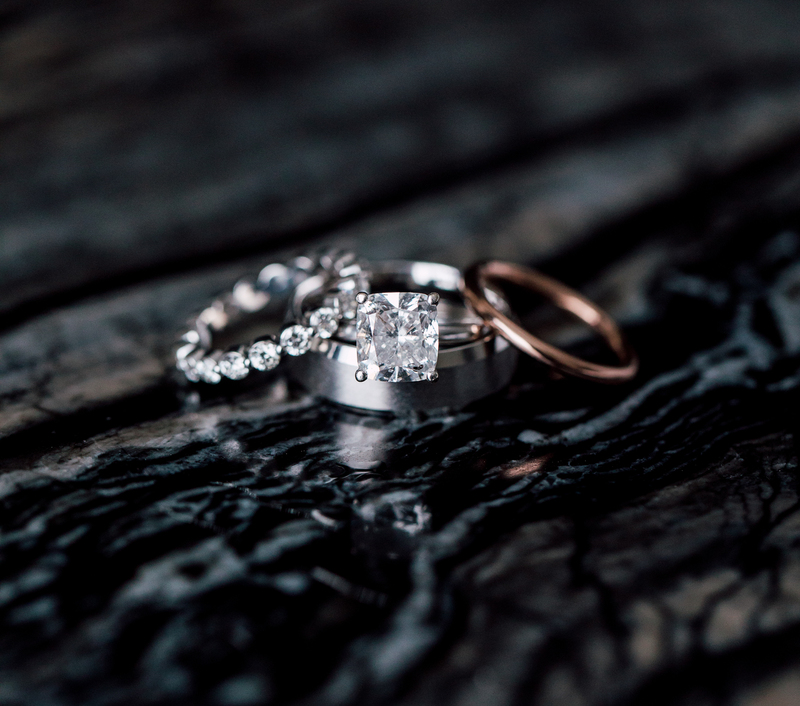 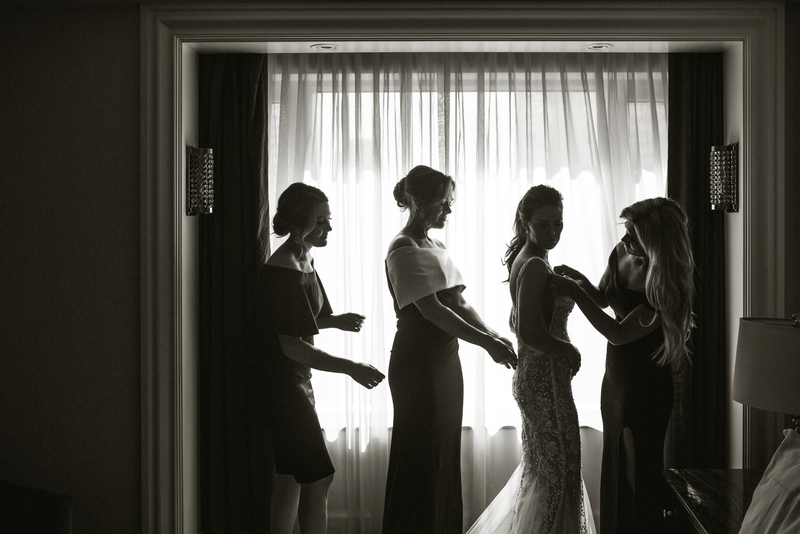 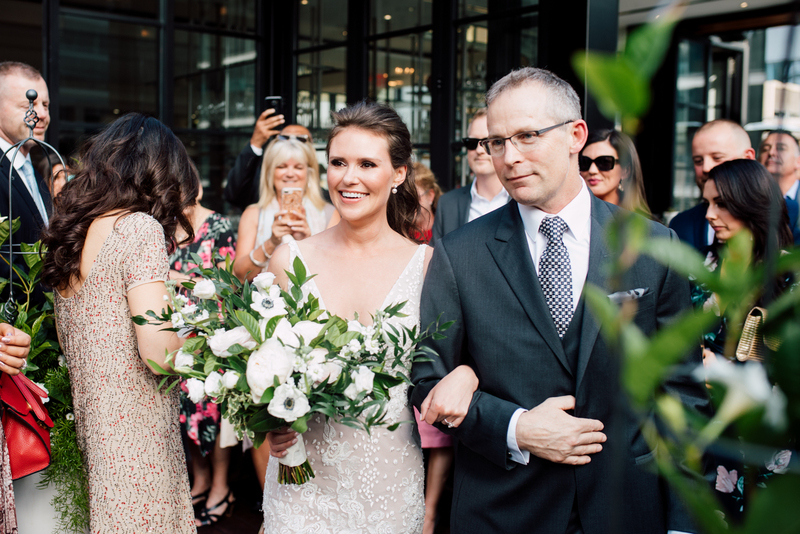 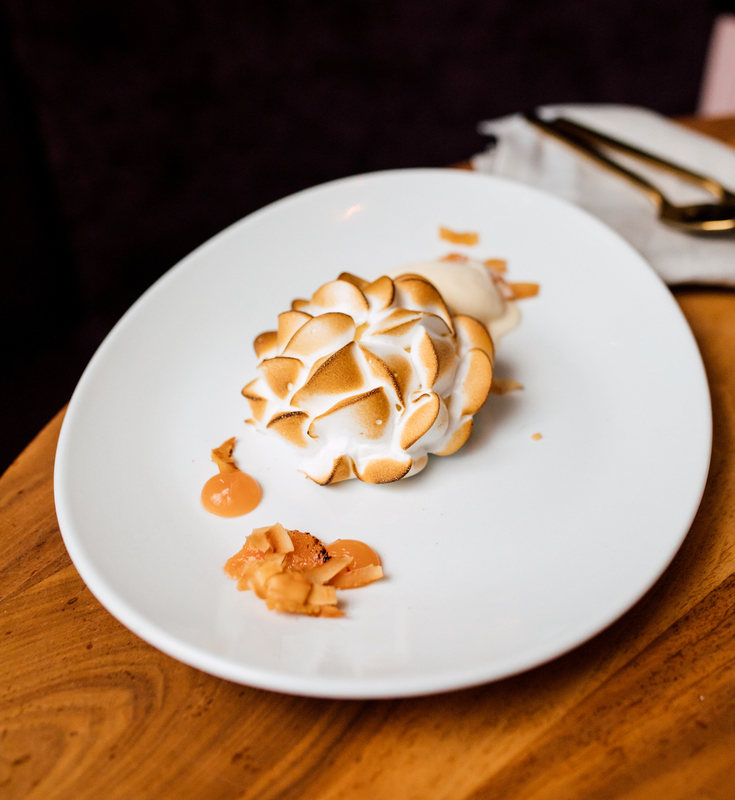 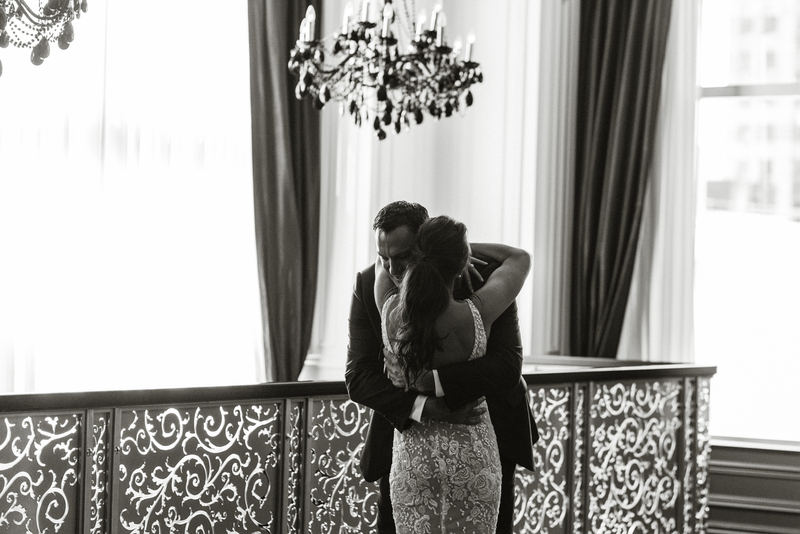 Meeting at the Adelaide Hotel, Stephanie and Tim’s first look was pure disbelief and joy. 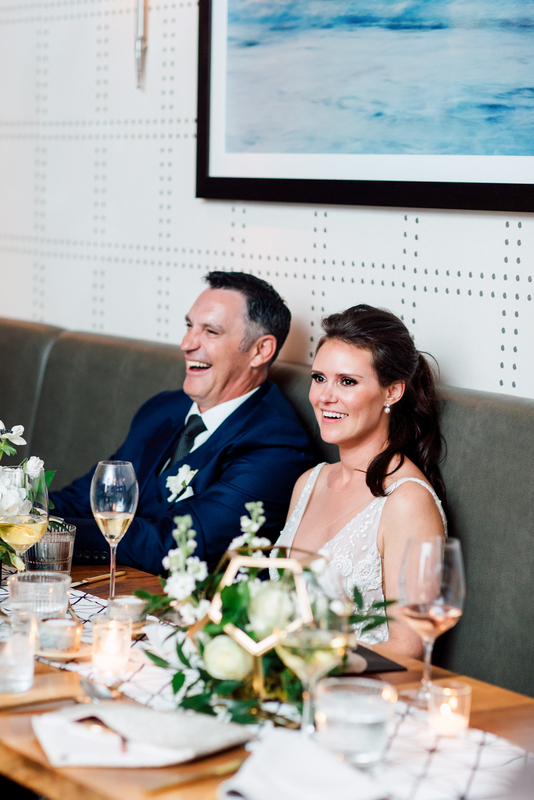 There’s no hiding their expressions of love and happiness! 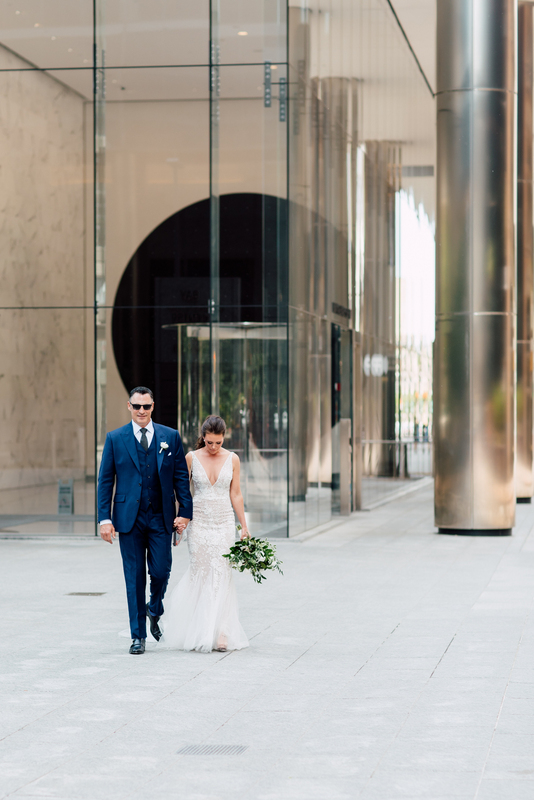 Their portraits were set against urban backdrops within the city. 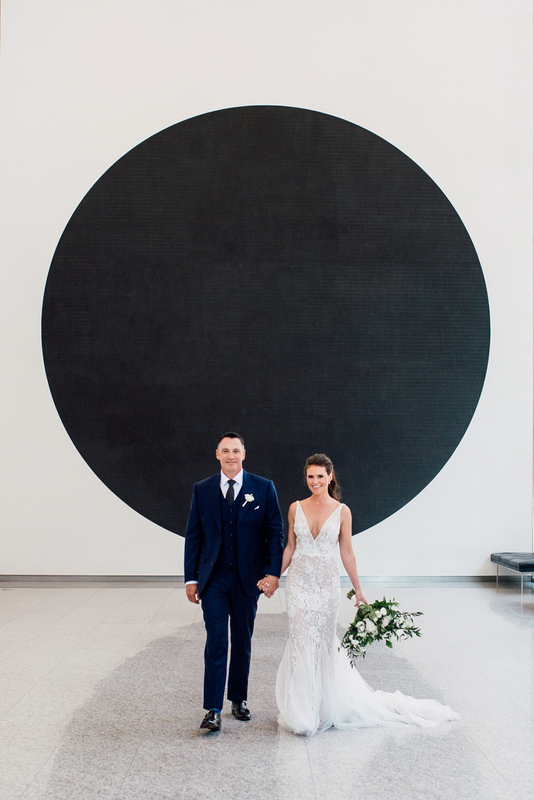 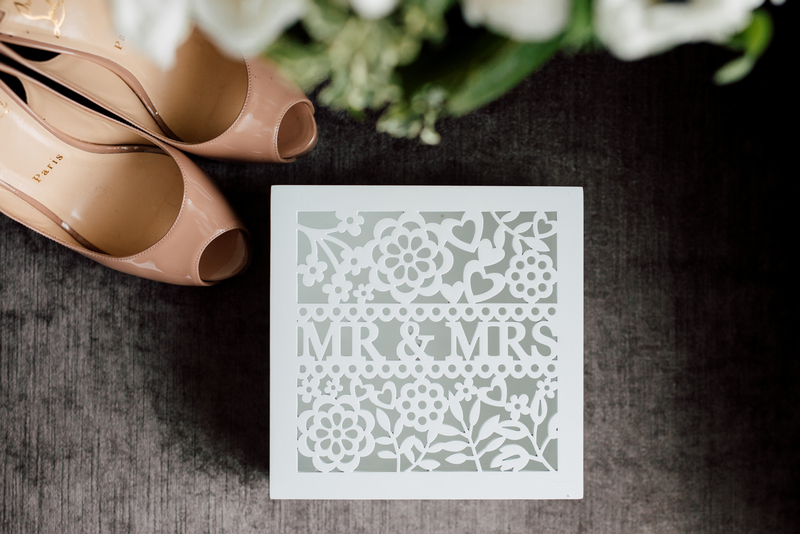 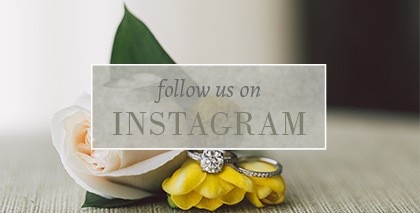 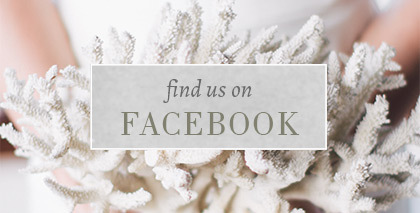 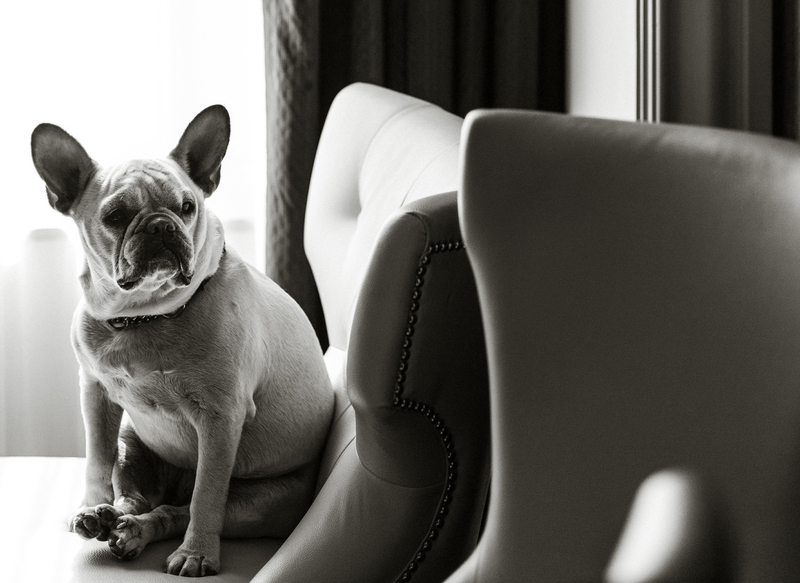 Graphic and minimal, they truly showcase their modern style, love and candid moments! 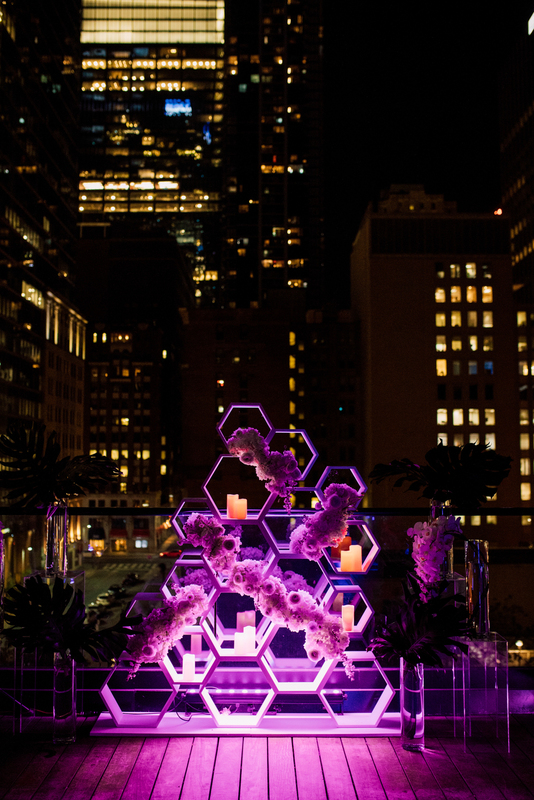 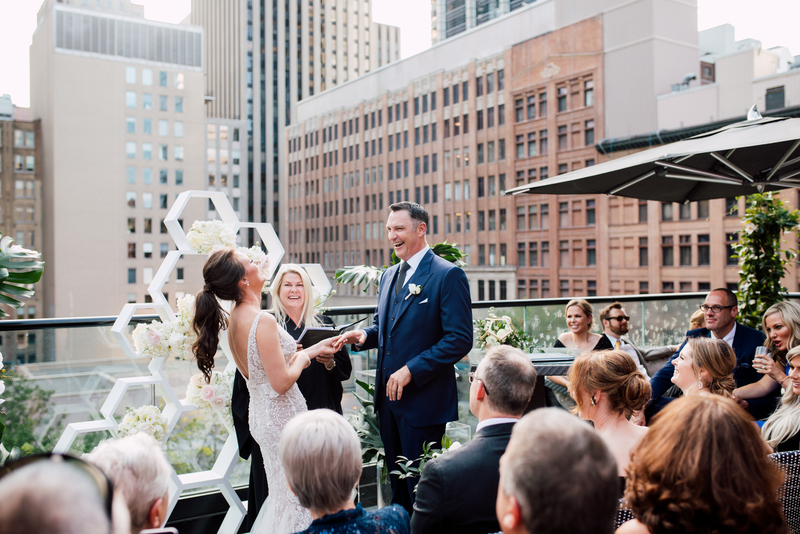 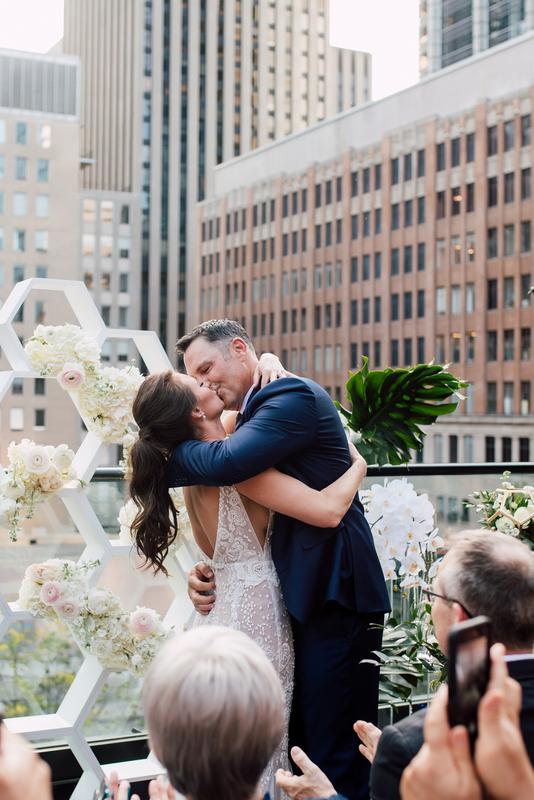 Having their ceremony outdoors on the terrace at The Chase, they had a honeycomb geometric backdrop provided by Engineered Arts. 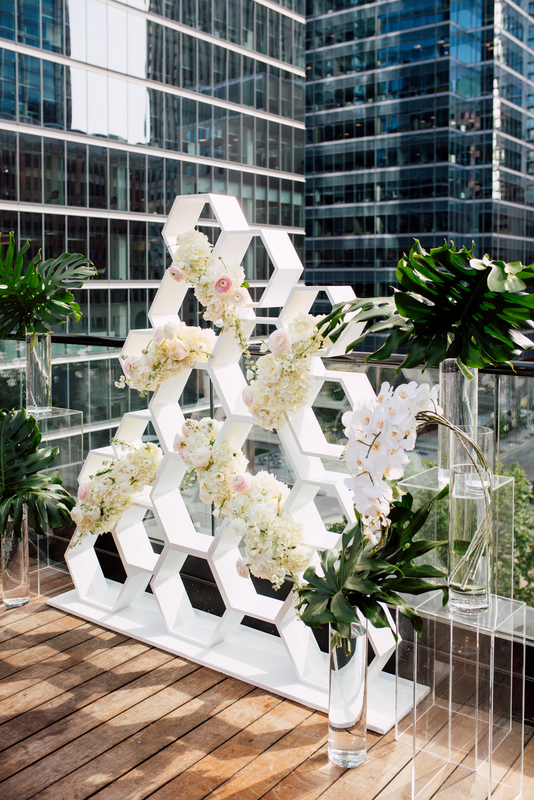 Decorated with intentional groups of simple white flowers, the structure was accentuated by striking tropical greenery and leaves giving the space an exotic feel on such a beautiful sunny summer day. 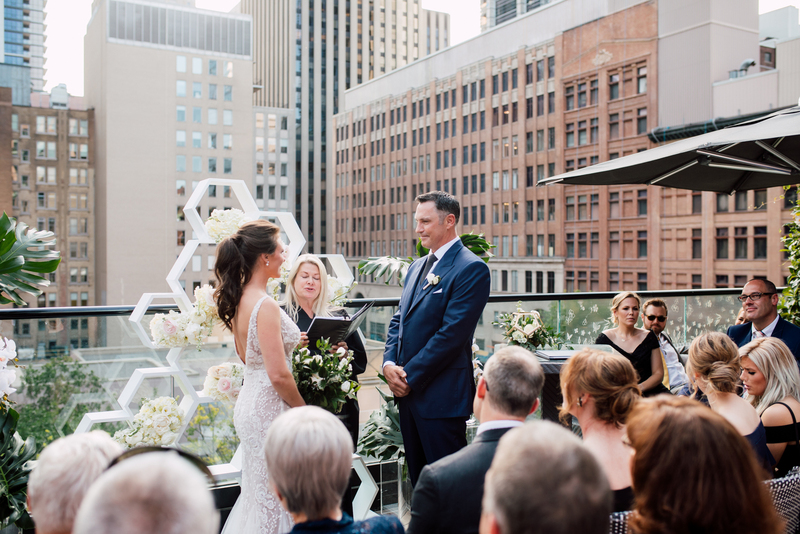 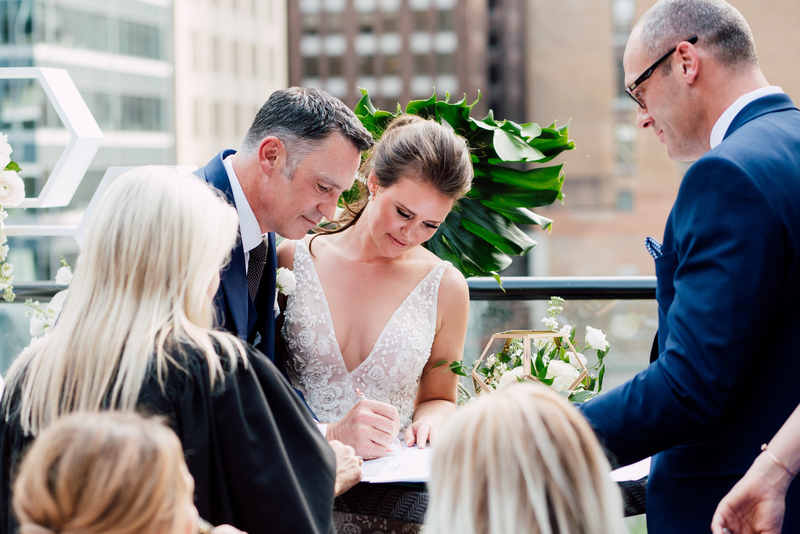 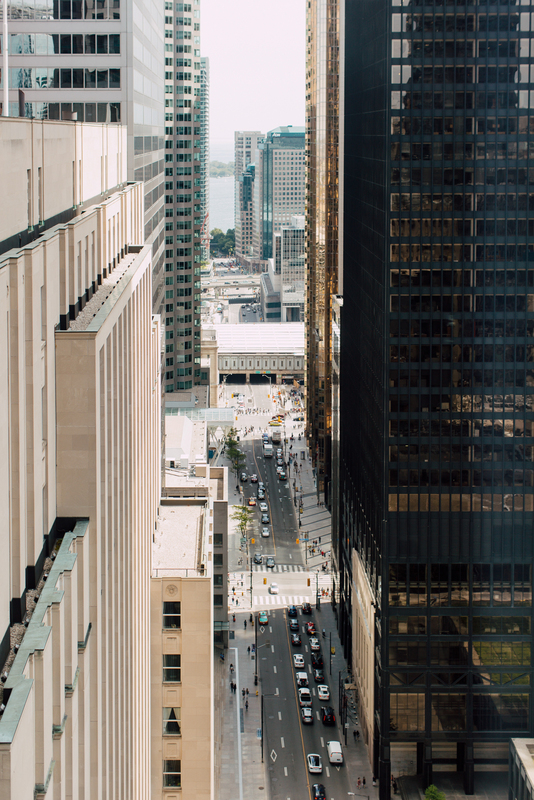 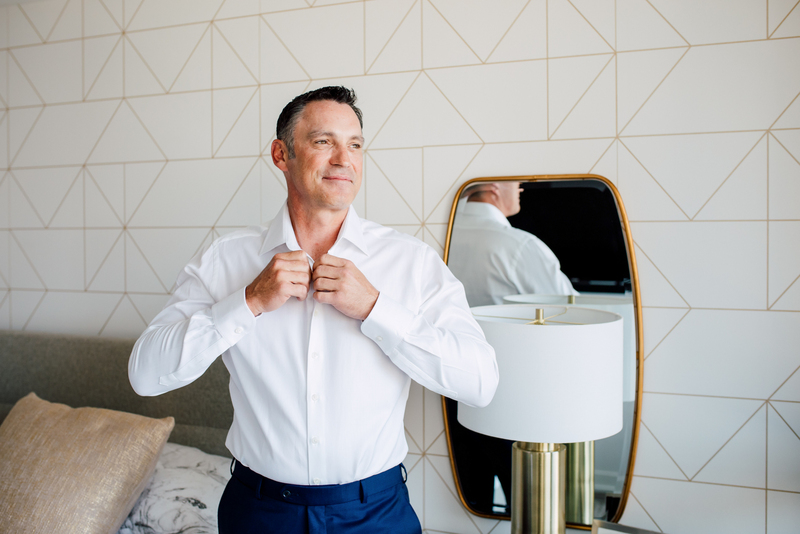 Having a smaller wedding, their ceremony was incredibly intimate, soaring above the busyness of the city. 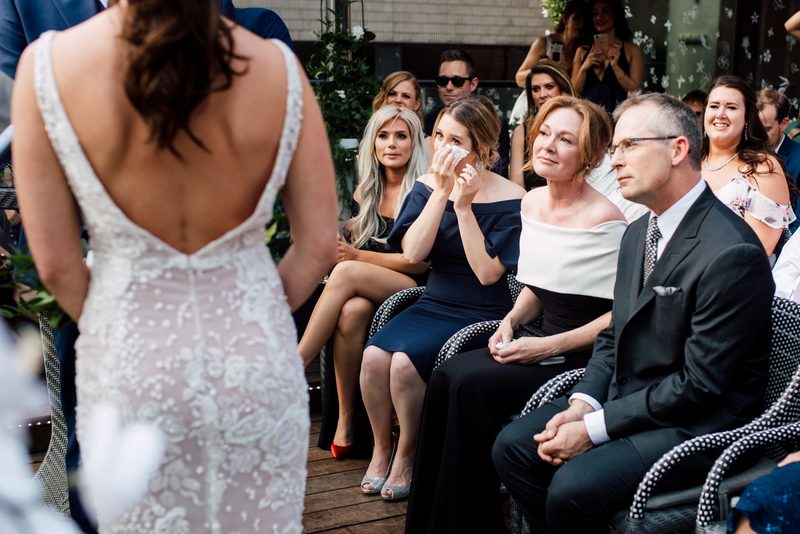 Stephanie was able to greet her guests and see everyone’s faces as she walked down the aisle making this ceremony so inclusive for their family and friends. 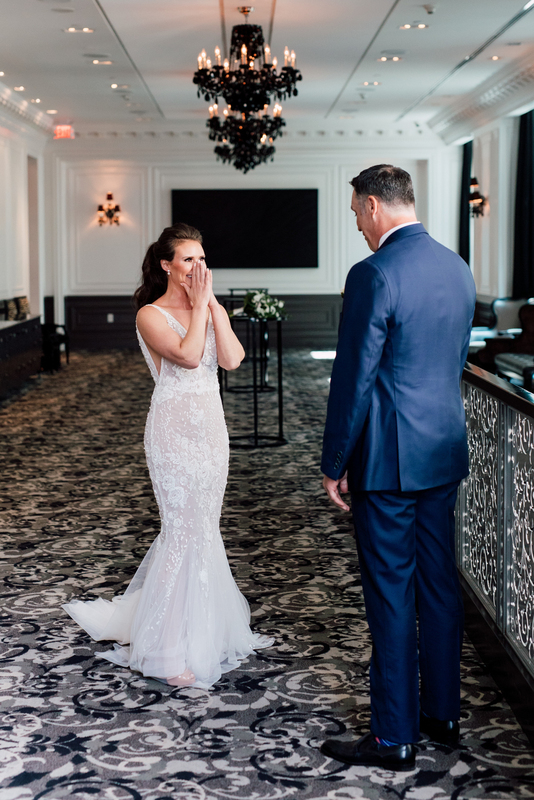 Filled emotions from the bride & groom and all of the guests, you can truly feel how happy everyone is to see Stephanie and Tim tie the knot! 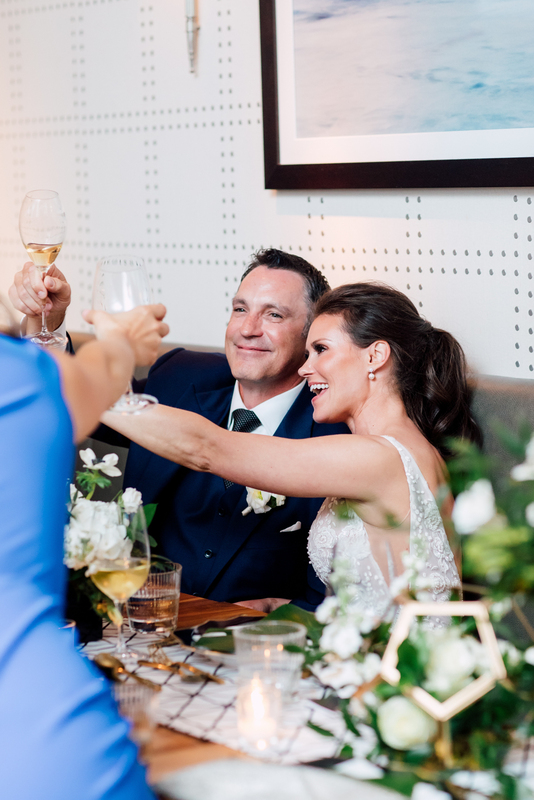 And who doesn’t love immediately being able to cheers your new spouse? 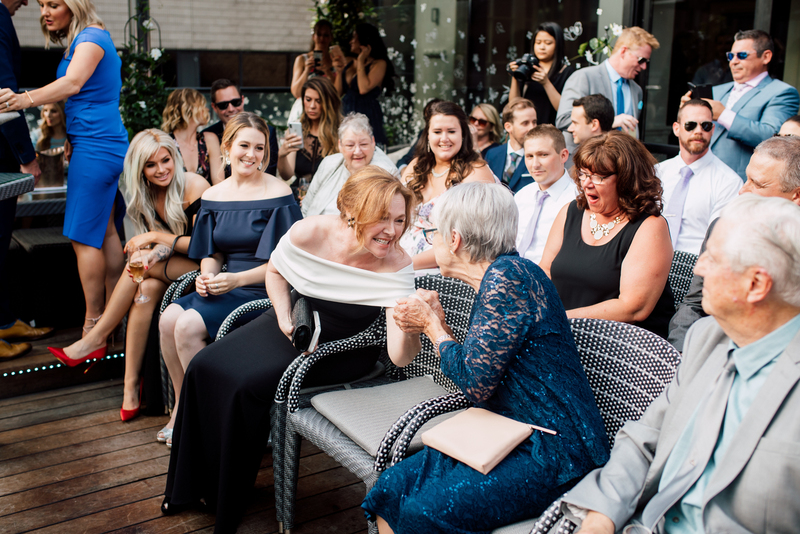 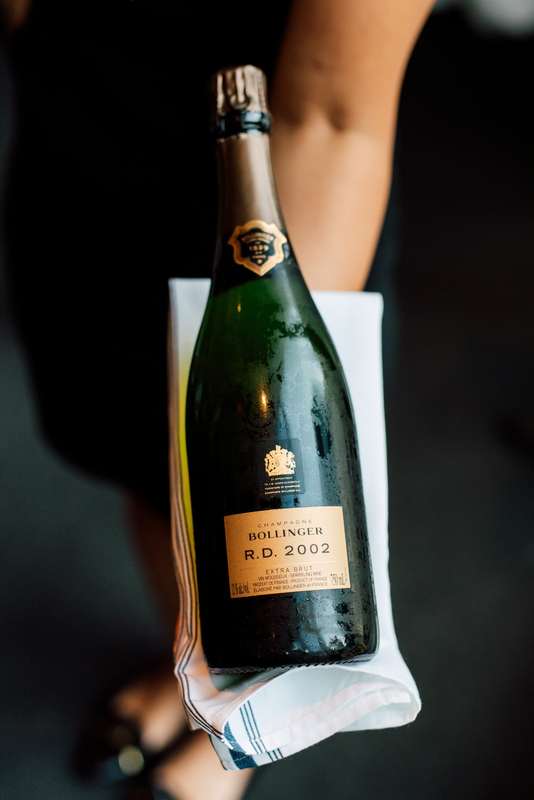 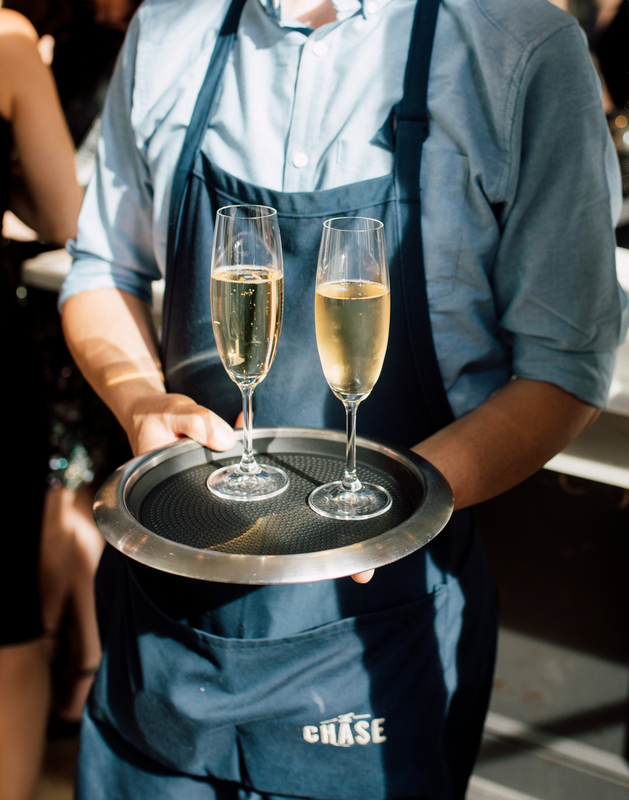 As soon as the “I do’s” were said, bubbles were passed around to begin the celebrating! 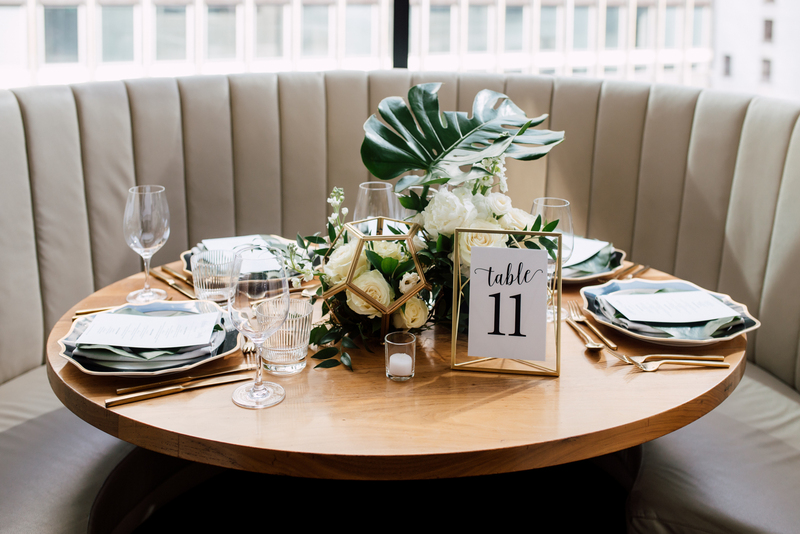 Their reception was held inside the restaurant with various tables and seating, giving a relaxed atmosphere without sacrificing style. 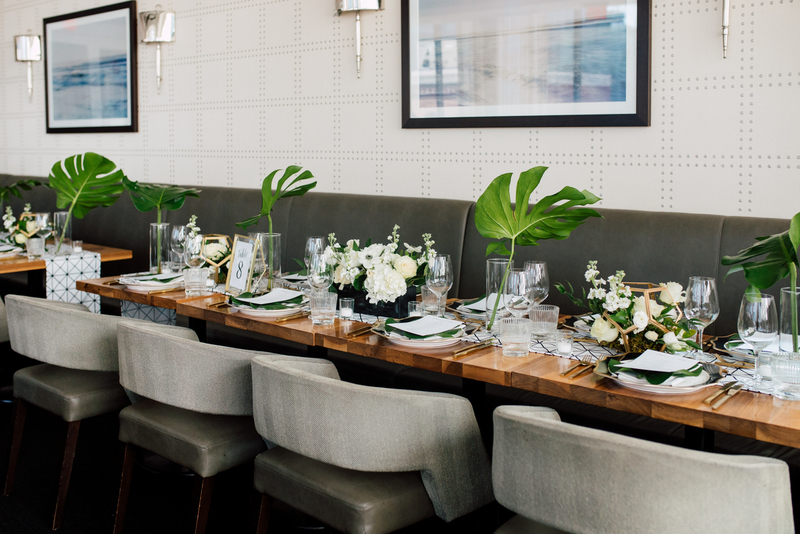 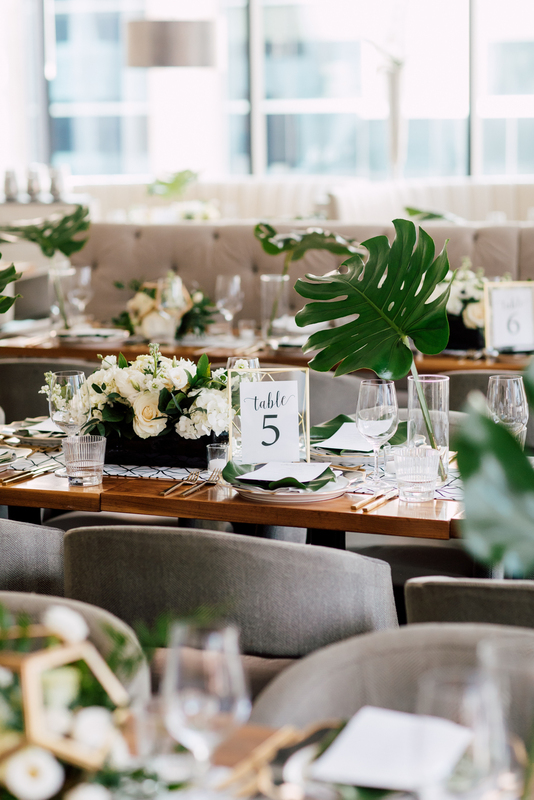 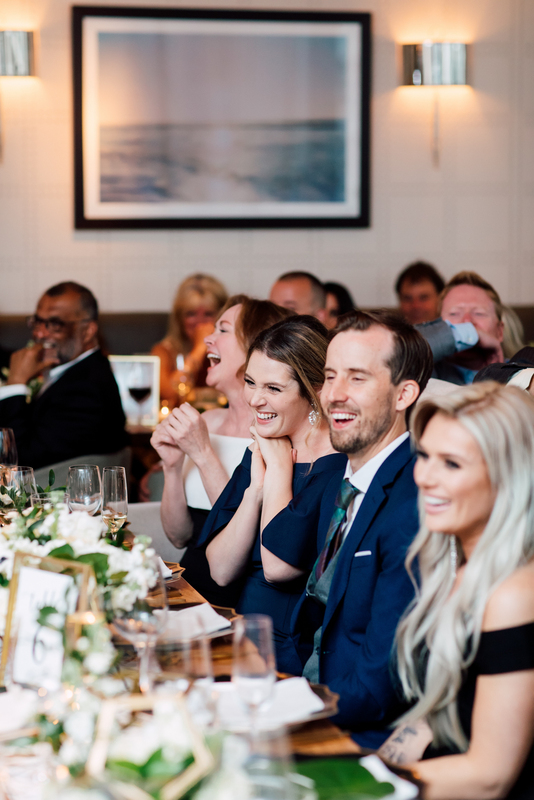 With simple arrangements of green and white with modern accents of Monstera leaves adding to their tropical contemporary theme, we love how the low arrangements promote talking amongst guests, making the evening a very social night. 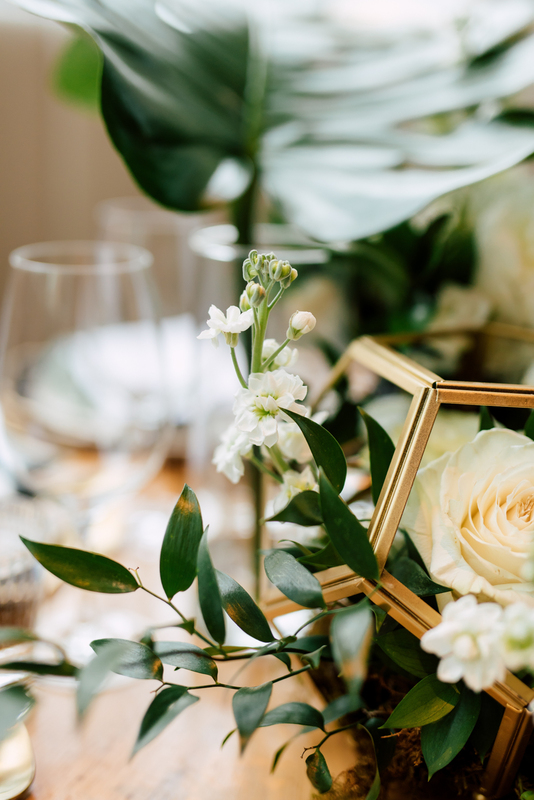 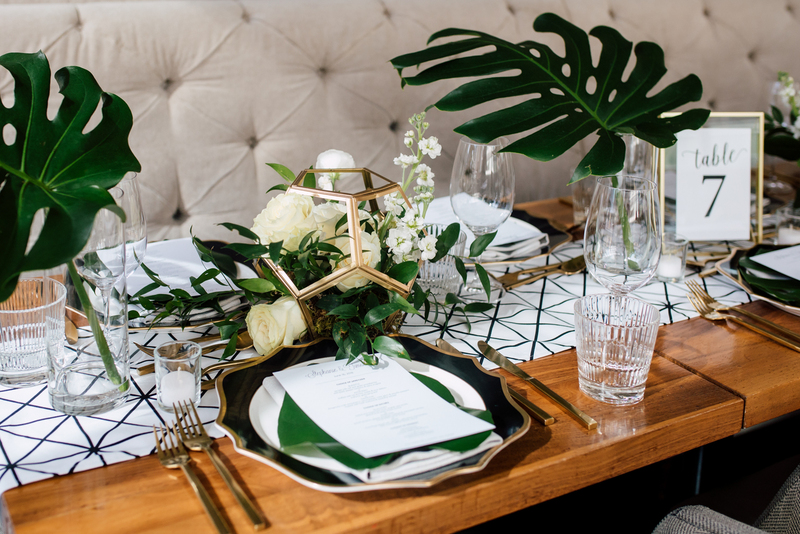 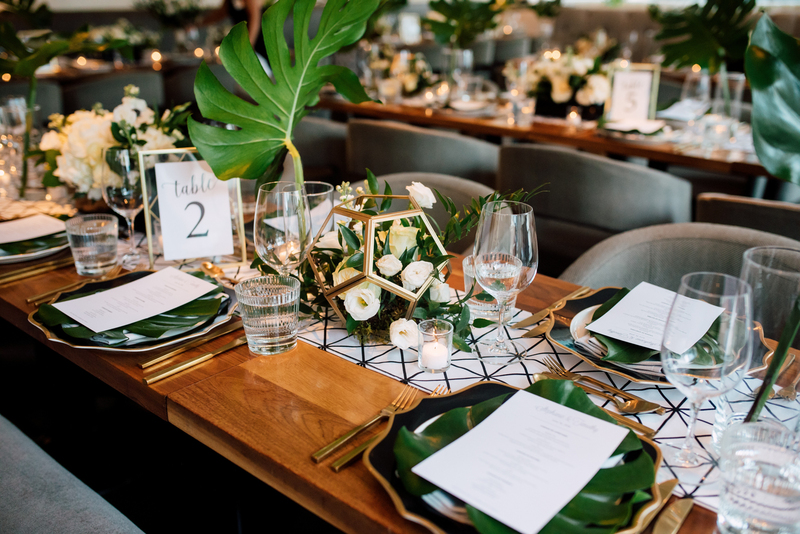 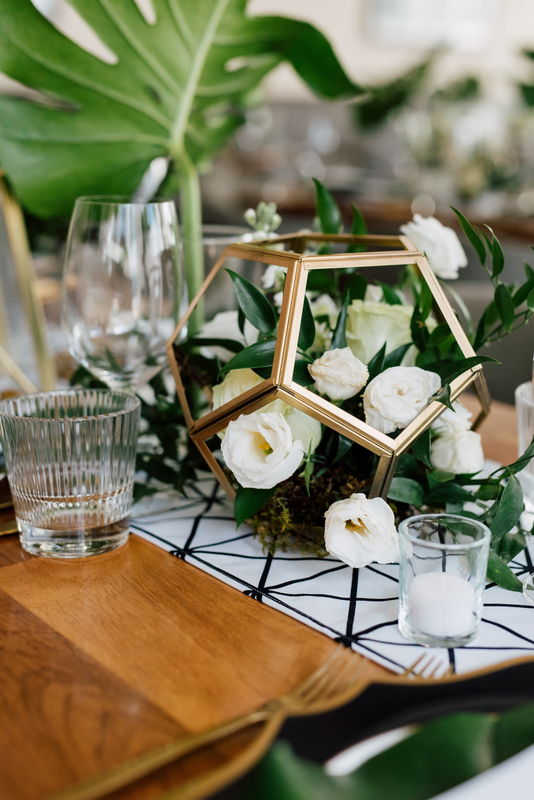 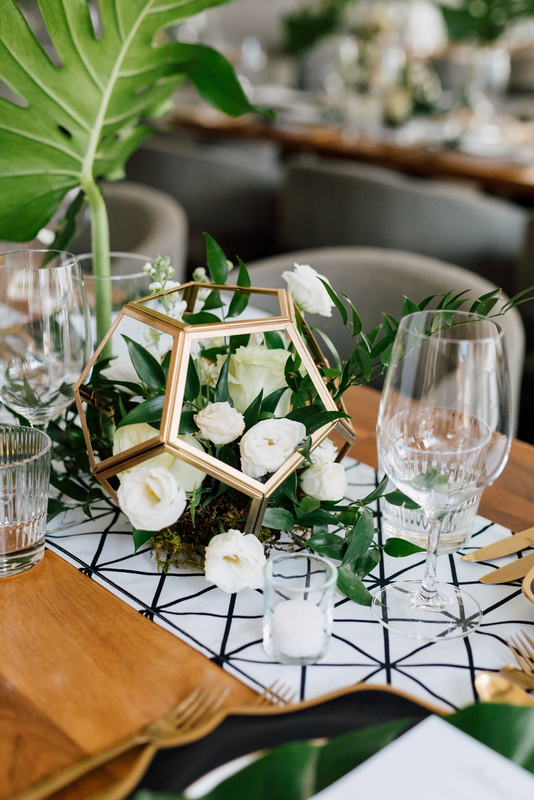 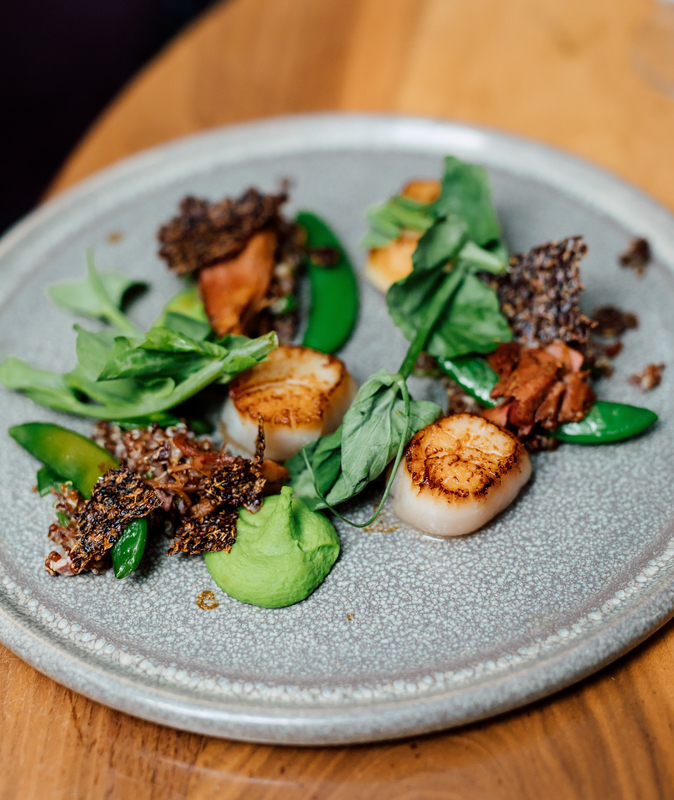 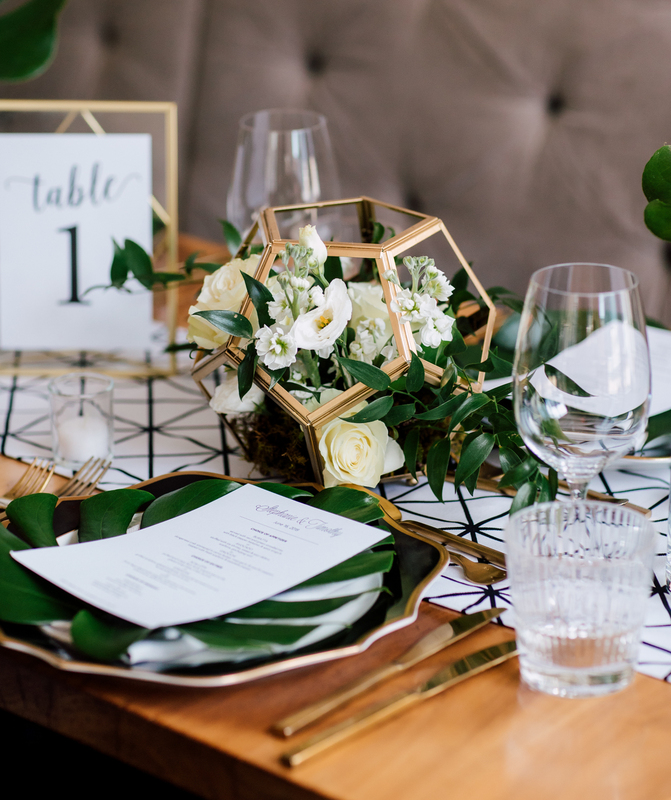 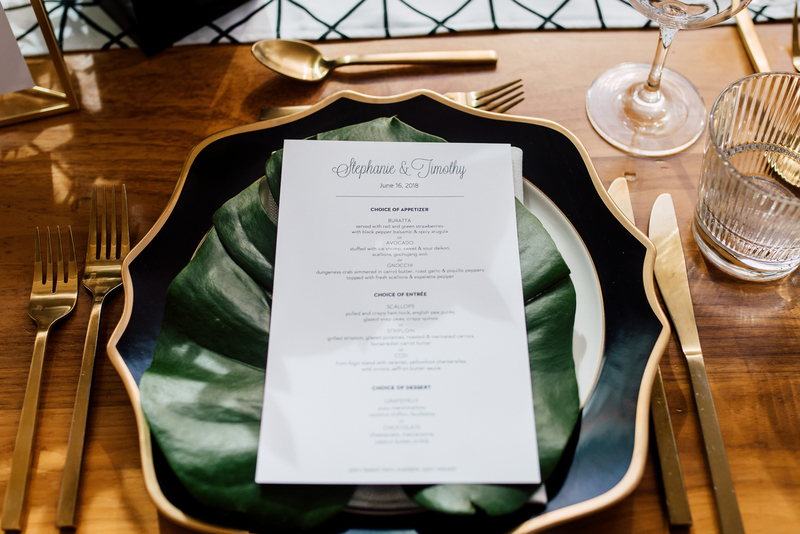 From geometric-patterned table runners and accents of black and gold in the place settings and cutlery, to gold geometric terrariums and frames, they truly tied in the aesthetic of the venue to their decor, making all of their details truly come together perfectly! 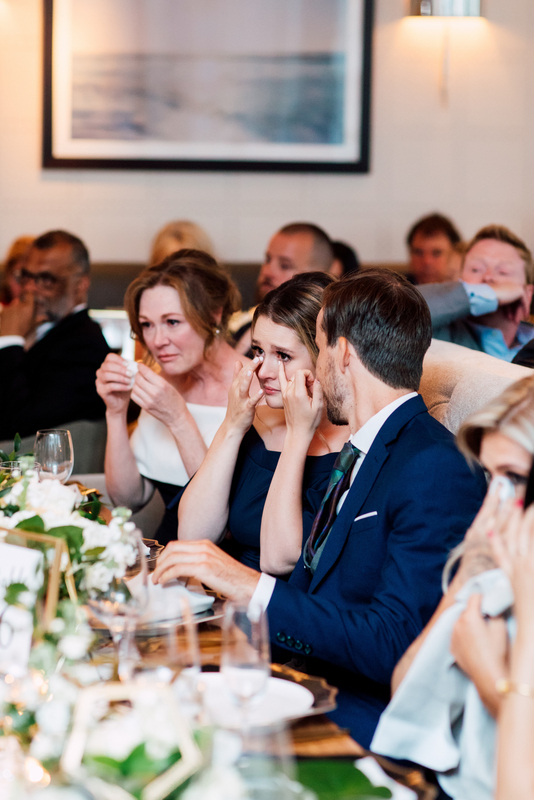 With the speeches and (delicious!) 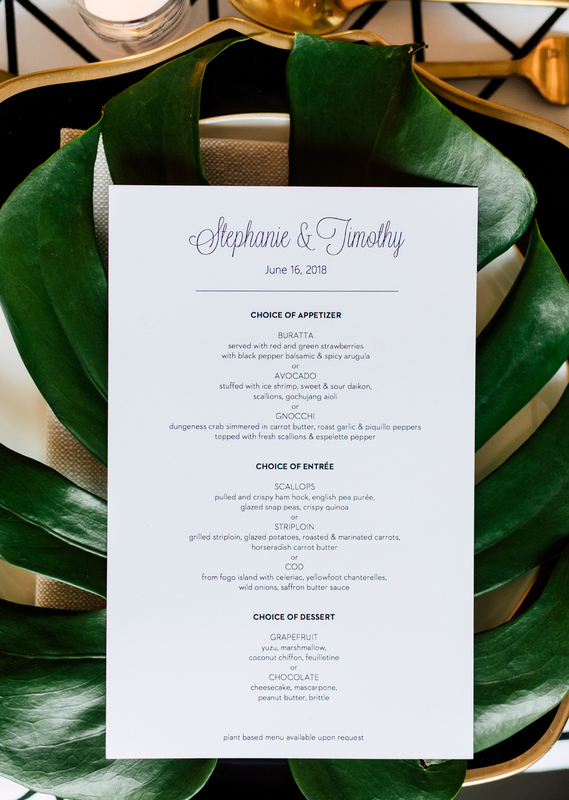 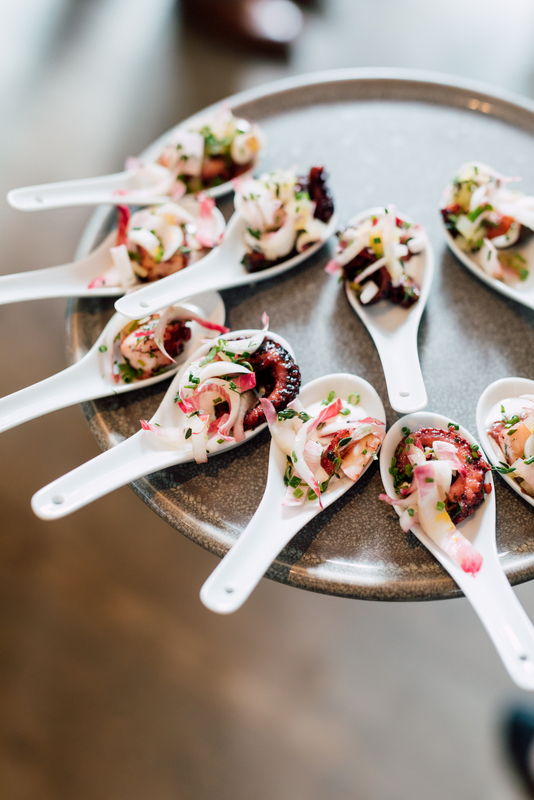 seafood meals finished, Stephanie and Tim’s geometric ceremony structure was lit up for the party, changing the atmosphere and making their first dance photos so impactful. 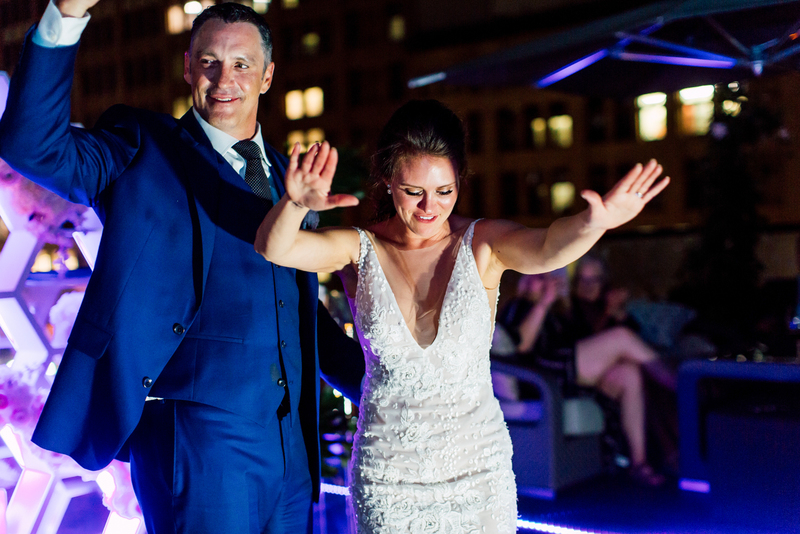 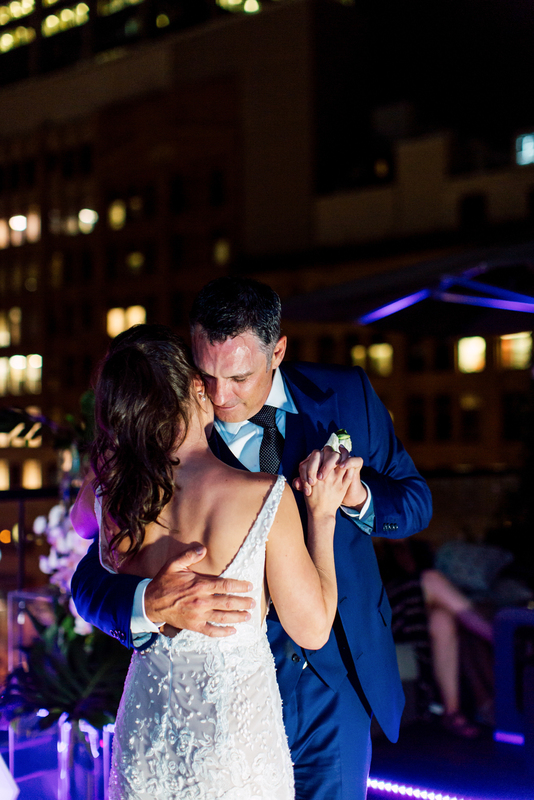 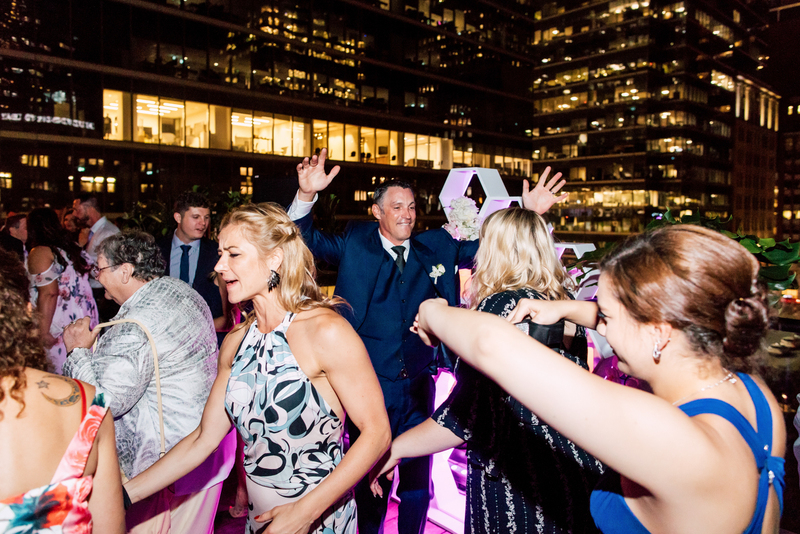 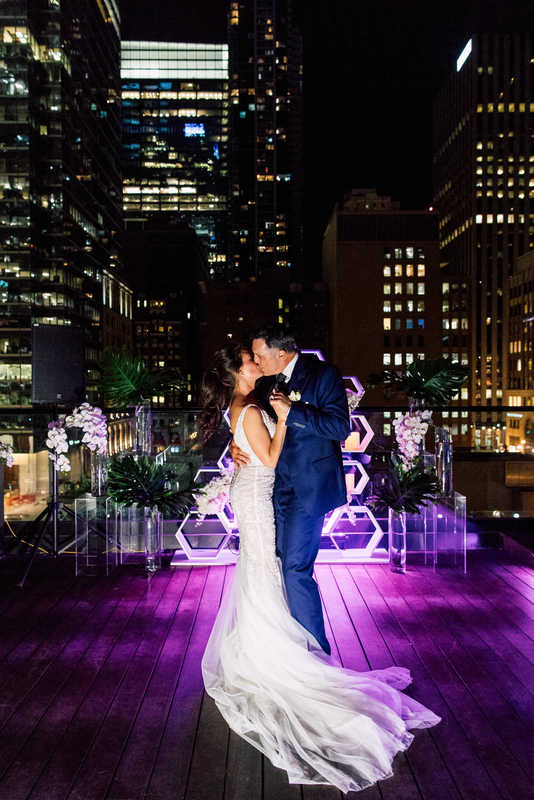 Surrounded by the city lights, you definitely know that you’re at a downtown urban wedding filled with style and happiness.